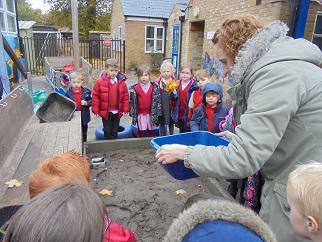 Autumn 1 - Who lives in a place like this? 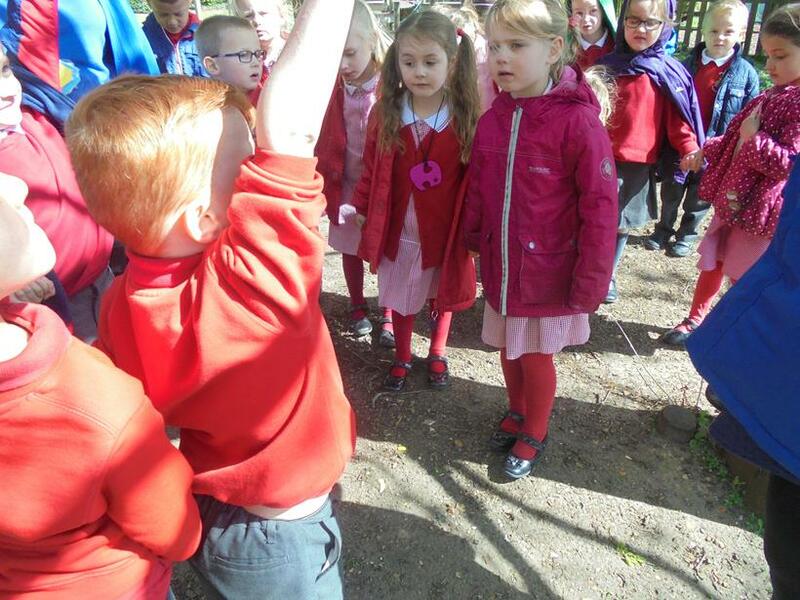 Autumn 2 - Frog or Prince? 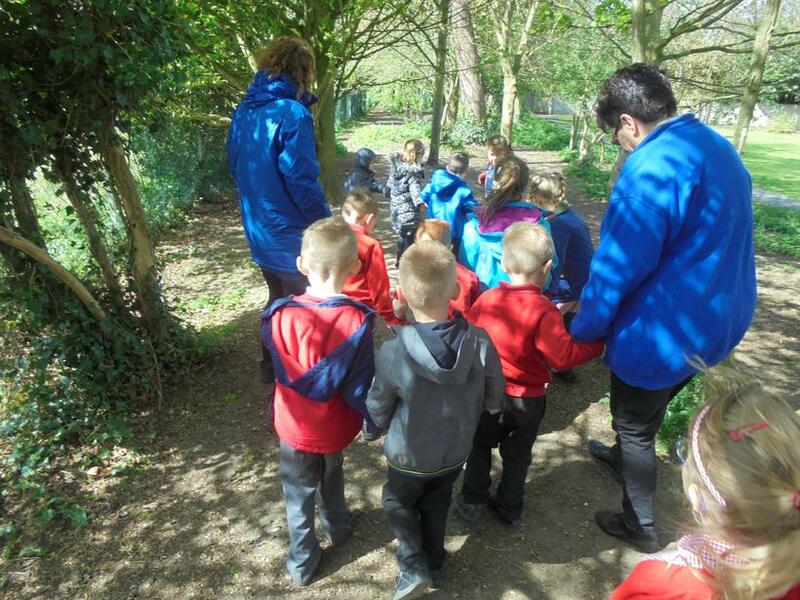 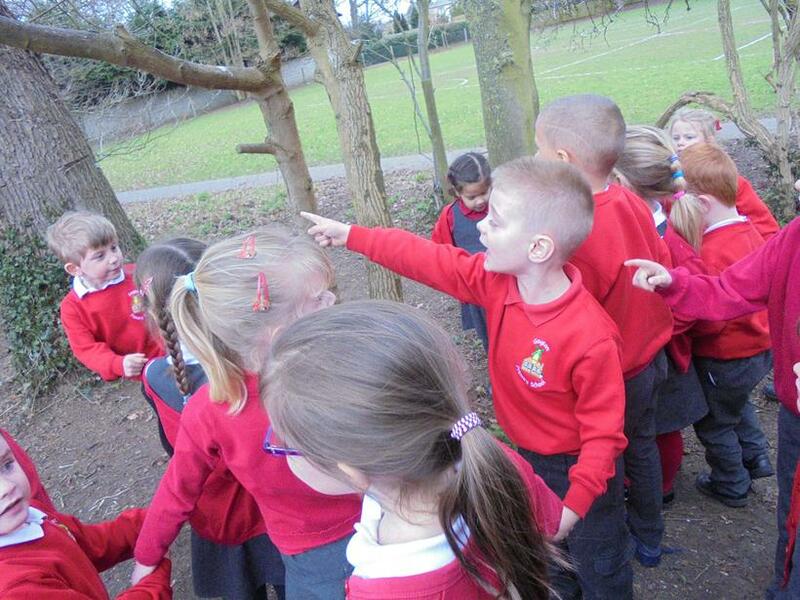 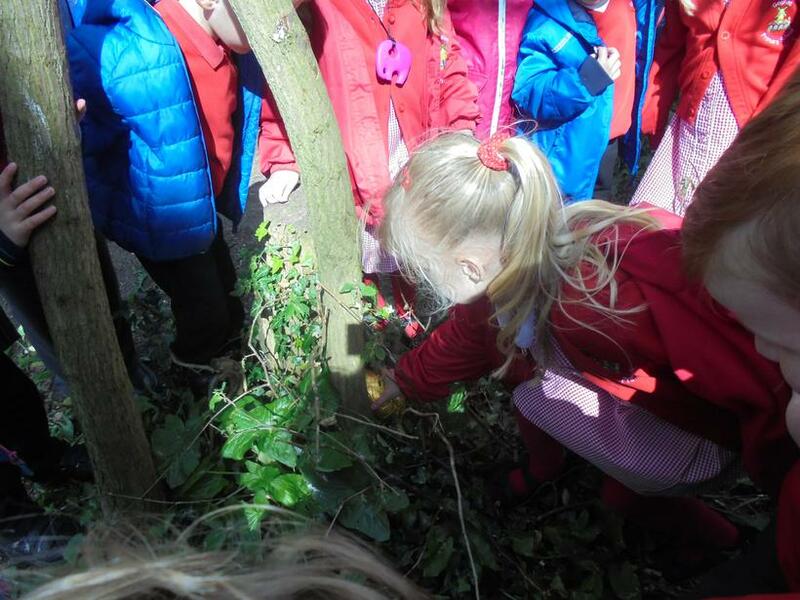 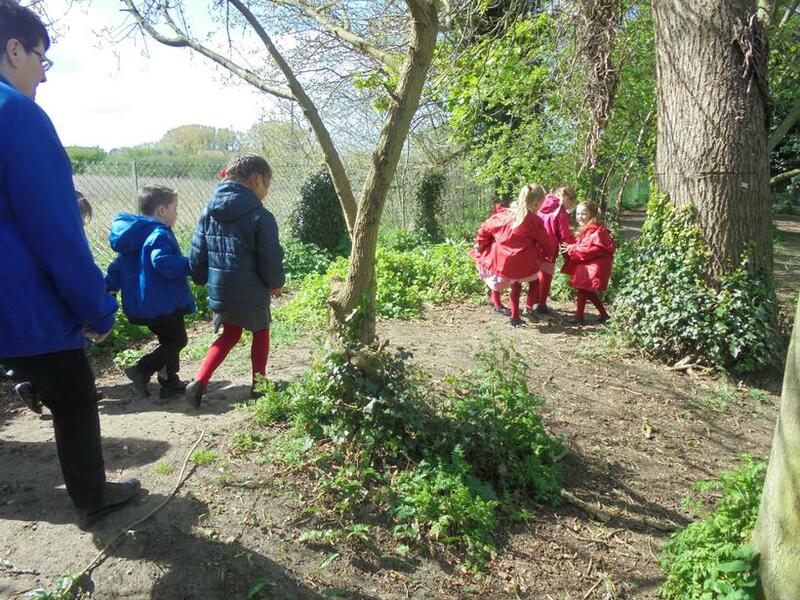 Ladybird Class found a slimy trail in their classroom. 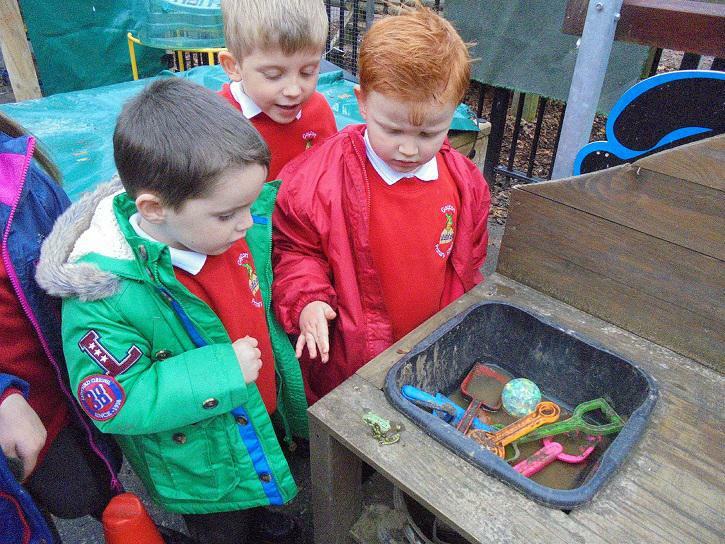 They followed it outside to find a frog sitting in the mud kitchen, the frog had a magic ball. 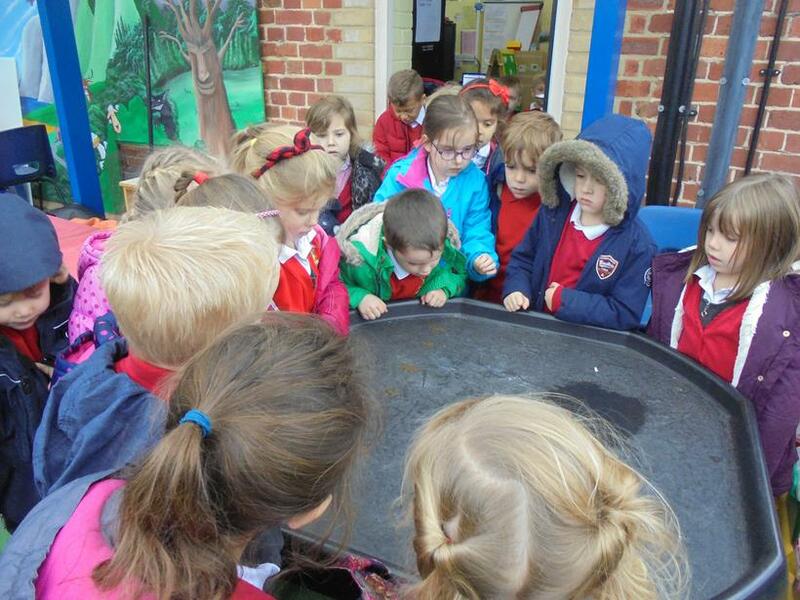 We took the frog into our classroom and made it a temporary home in a washing up bowl. 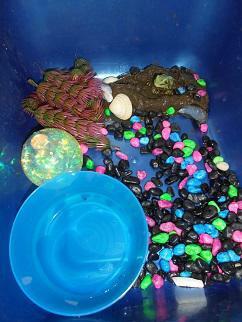 The next day we made it a nicer home in a tank. 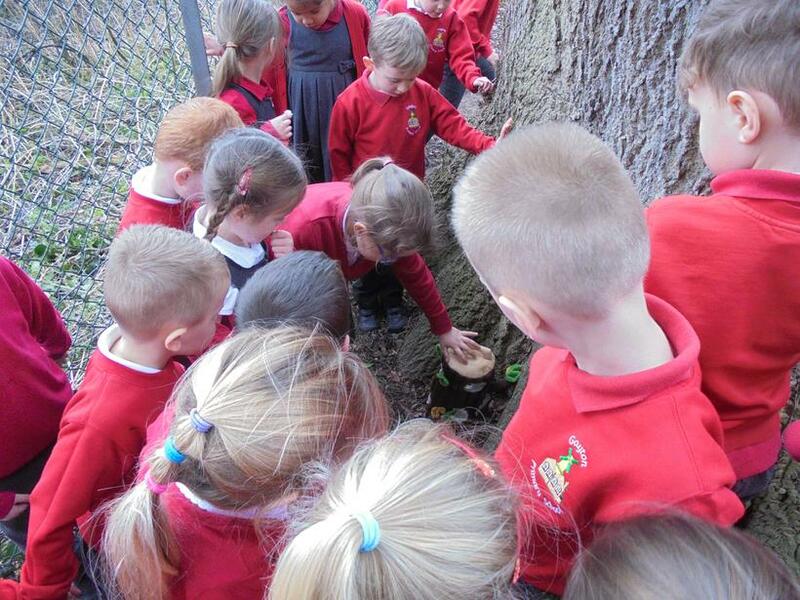 The Ladybirds talked about all the things a frog would need to stay alive. 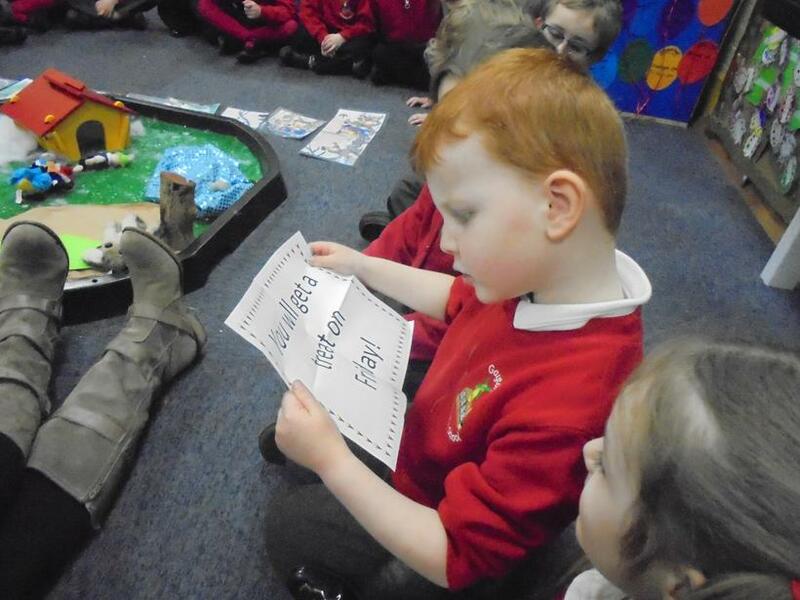 We also discussed the difference between frogs and toads so that we knew what we were dealing with. 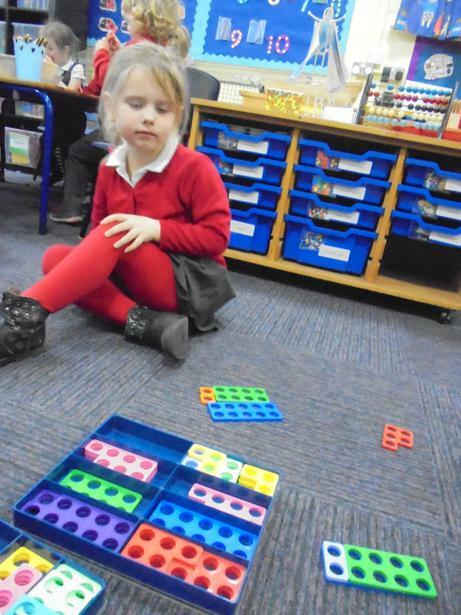 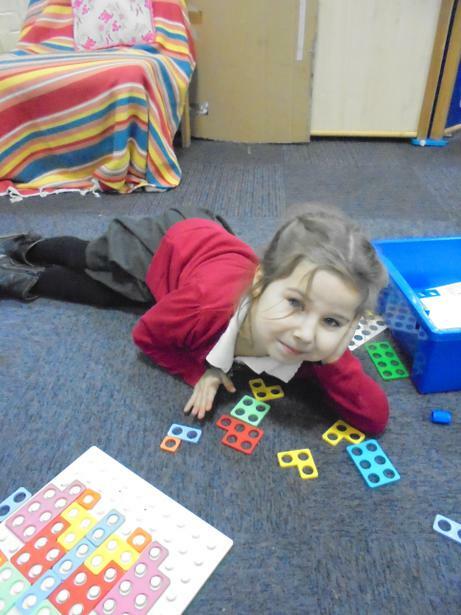 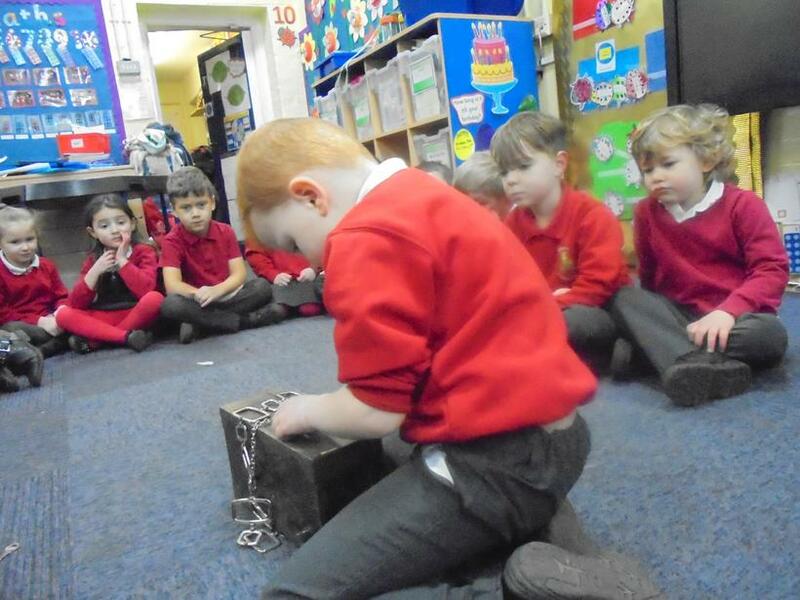 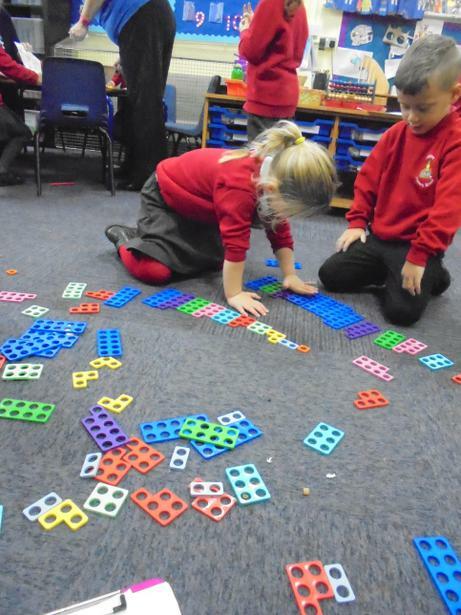 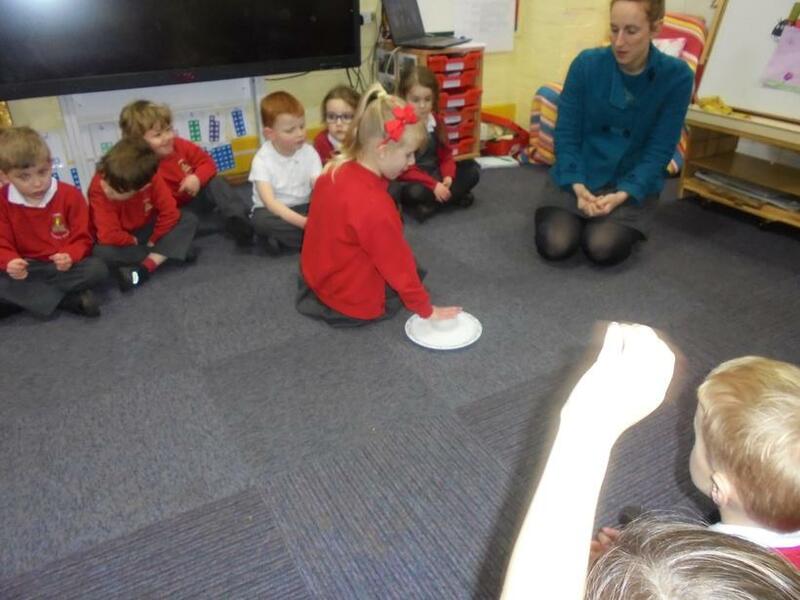 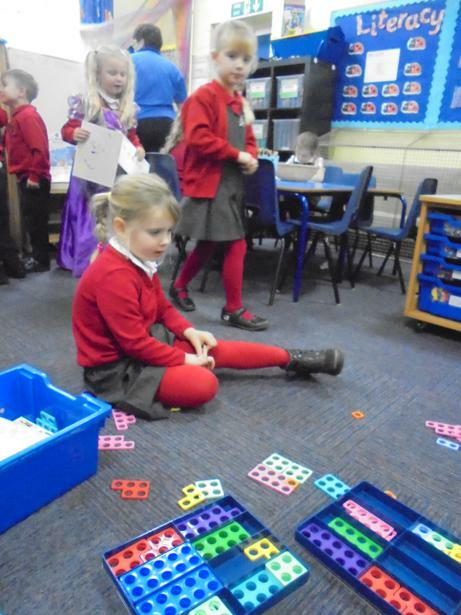 The children in Ladybird Class have been using Numicon to help them develop their number skills. 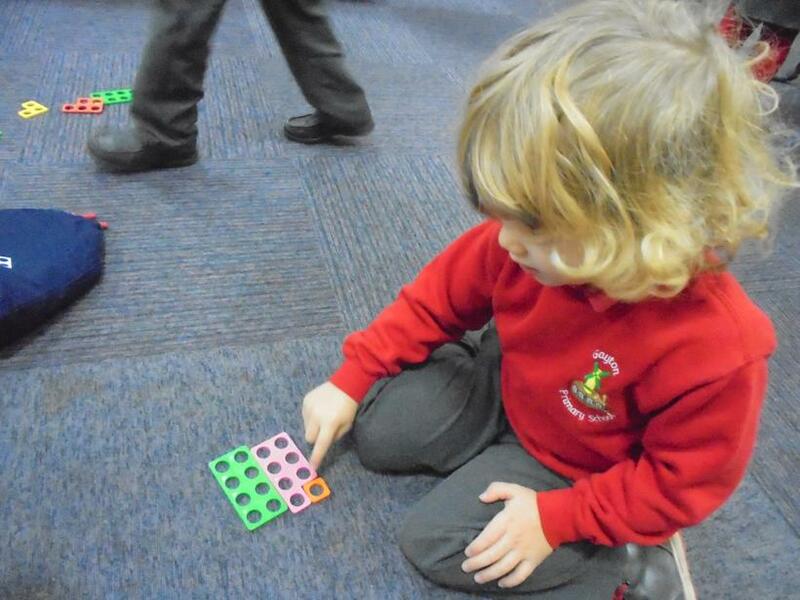 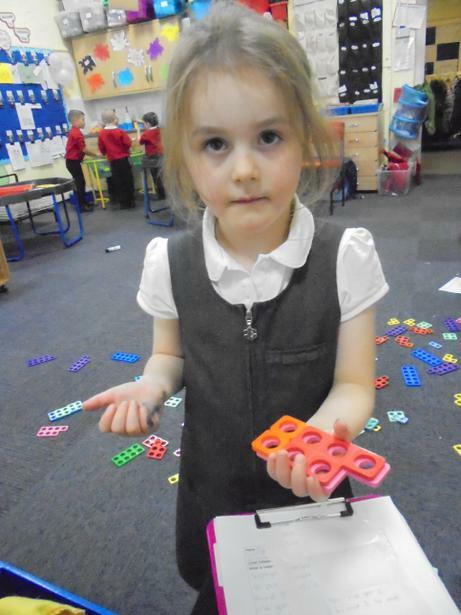 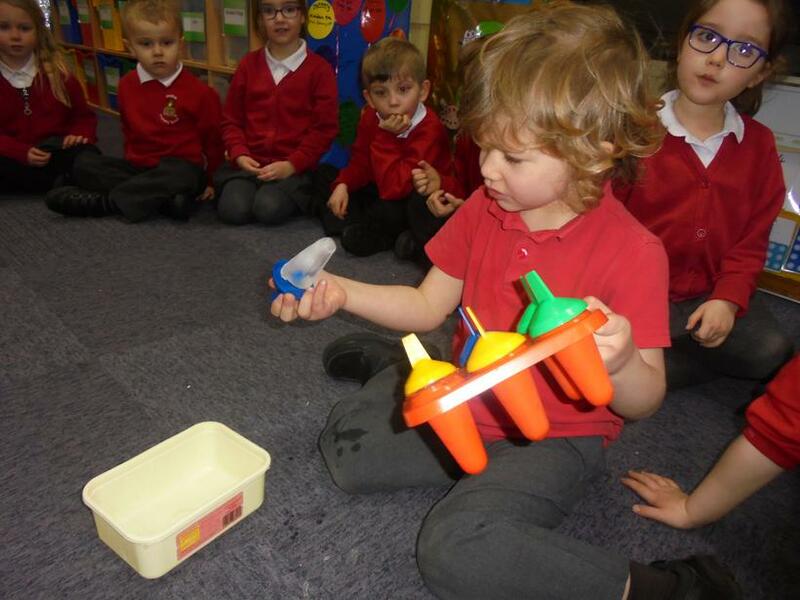 They have really enjoyed playing with the Numicon and it has made a huge impact on their learning. 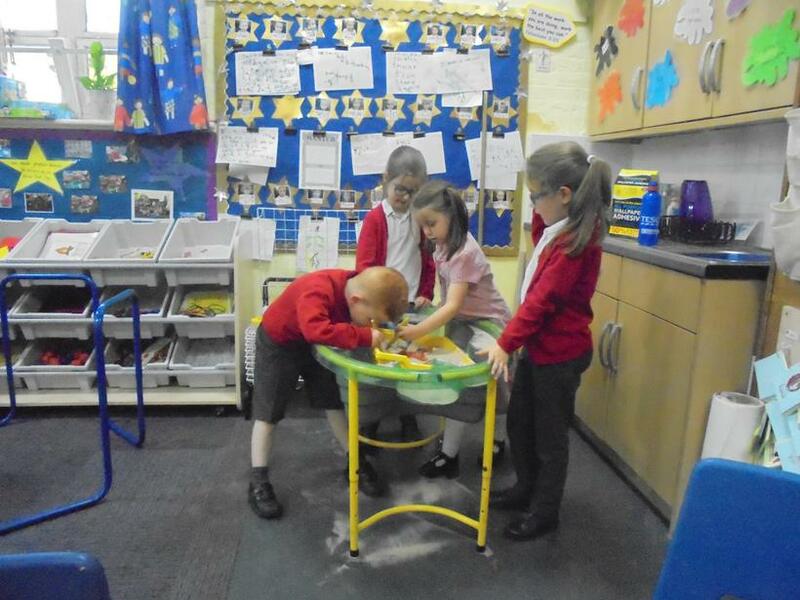 Here are some pictures of the children busy at work. 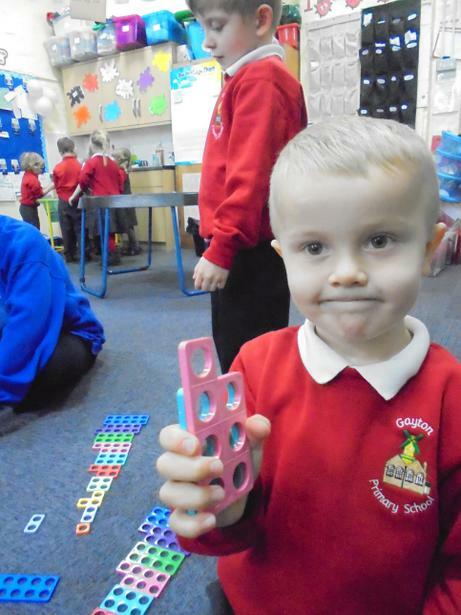 If anyone is interested in extending this learning at home Numicon is available to buy. 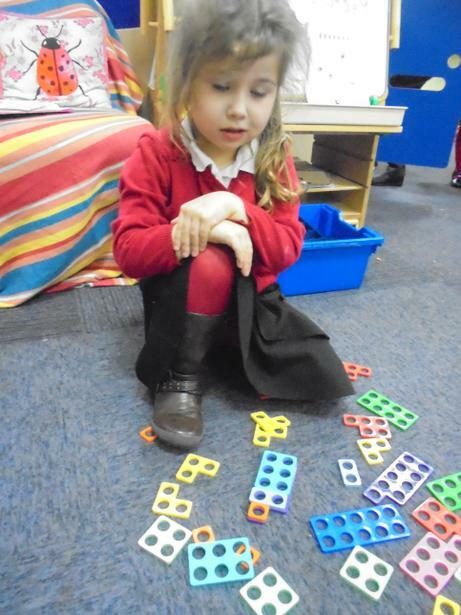 Google - First Steps with Numicon at Home Kit - to find buying options. 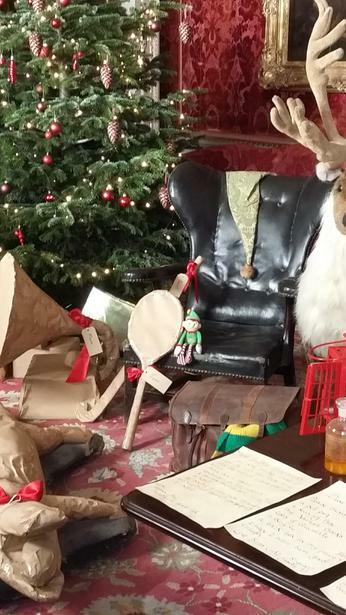 What has that naughty elf been up to? 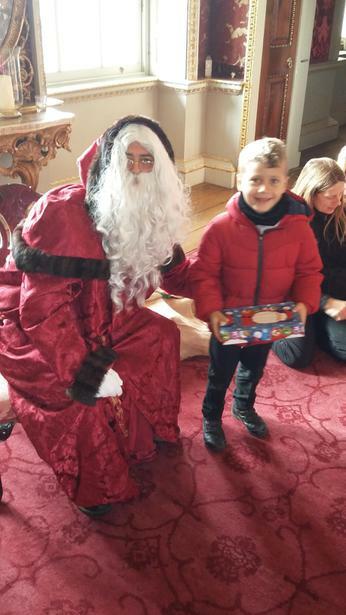 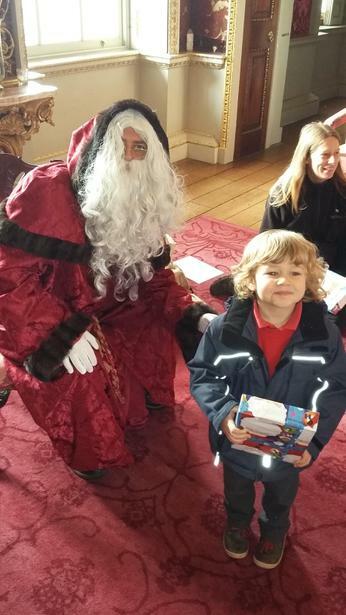 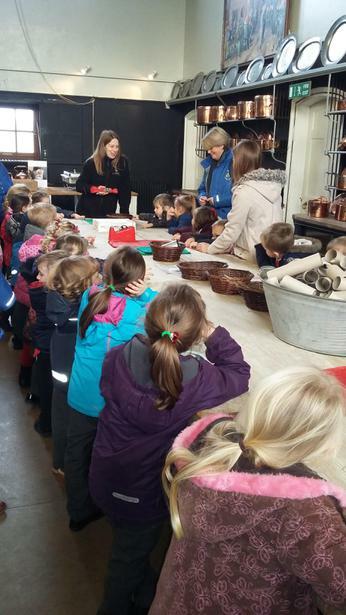 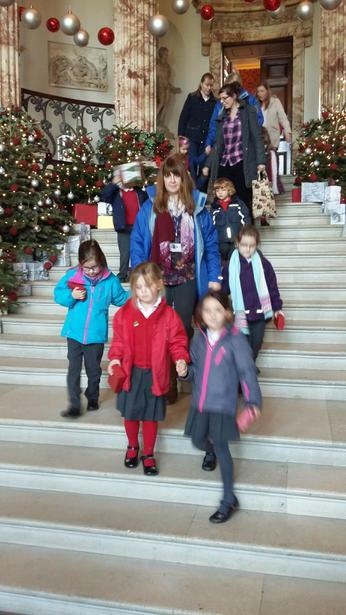 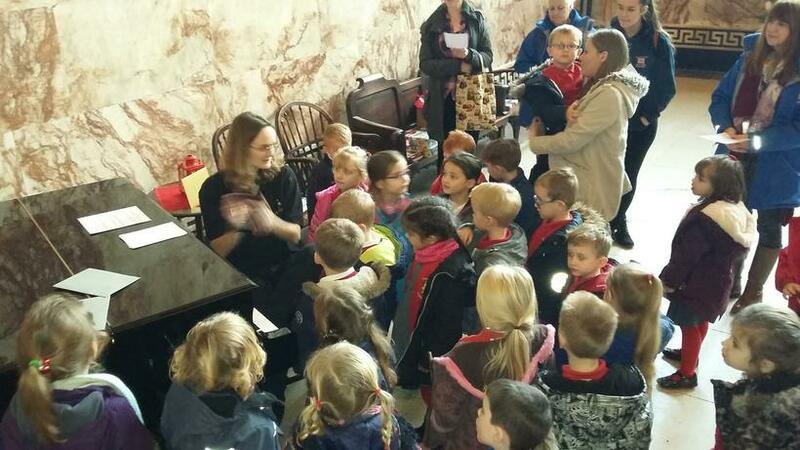 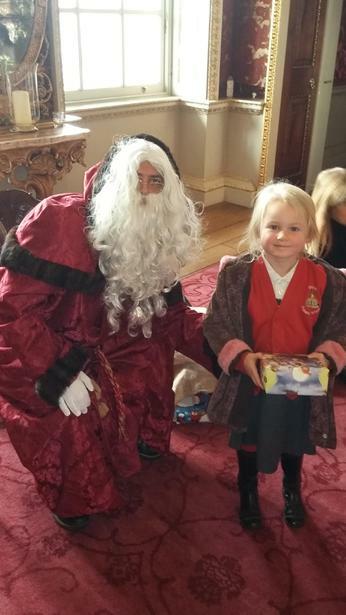 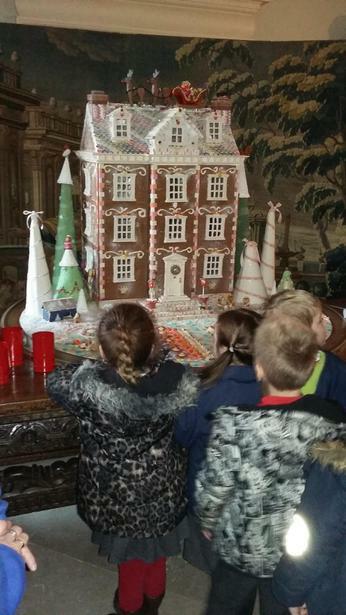 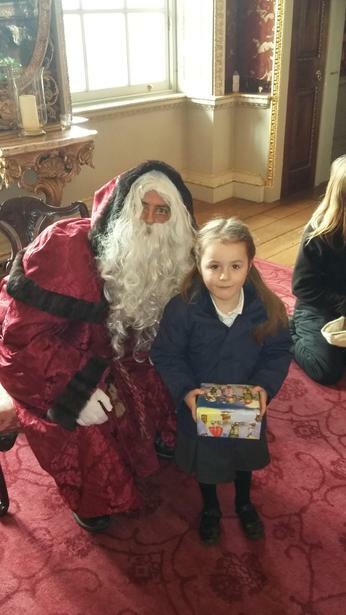 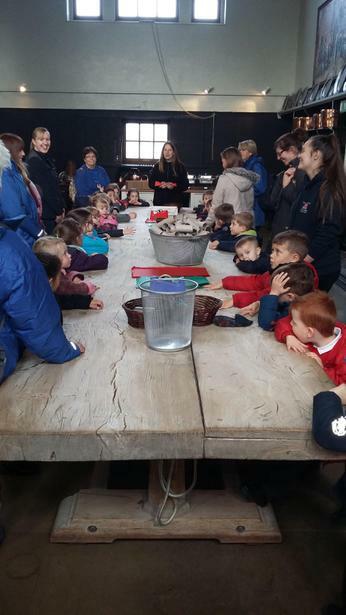 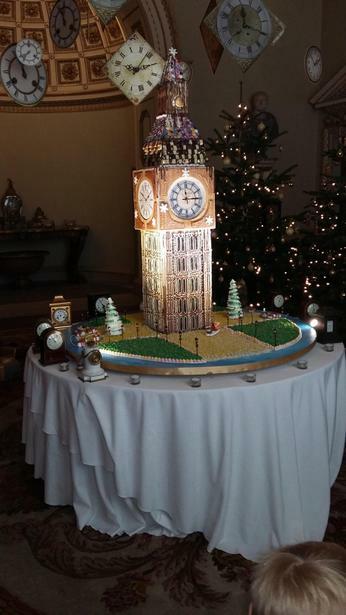 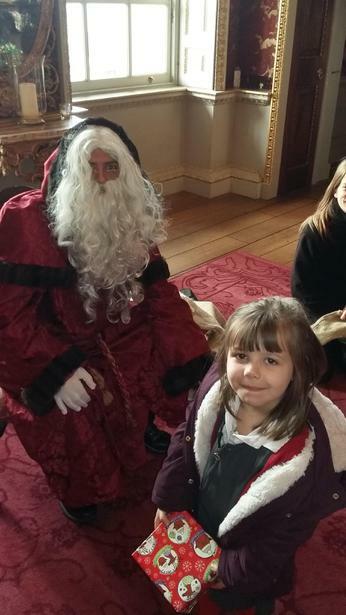 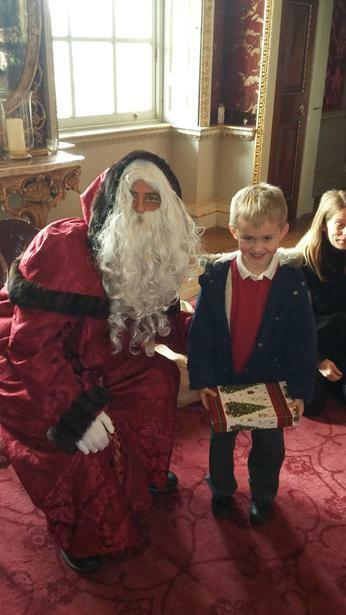 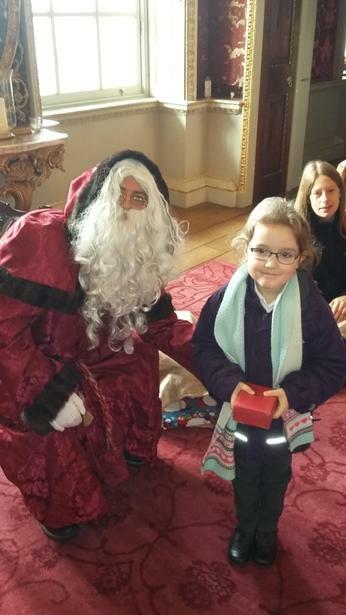 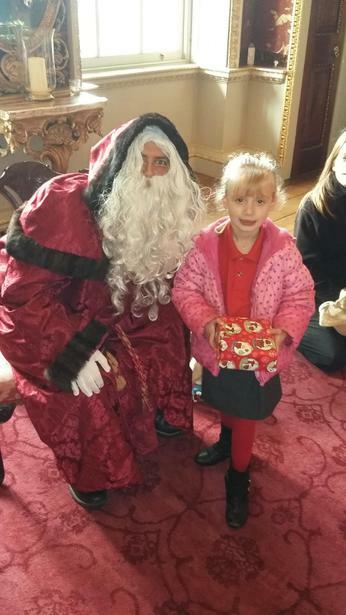 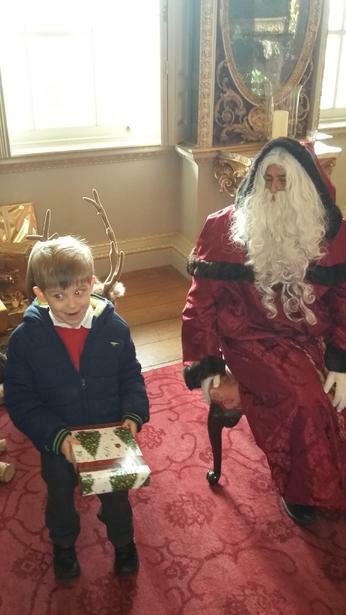 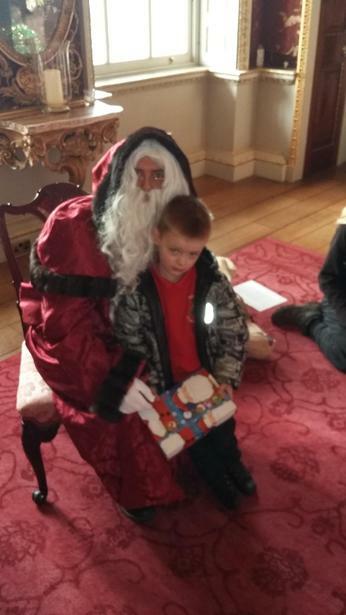 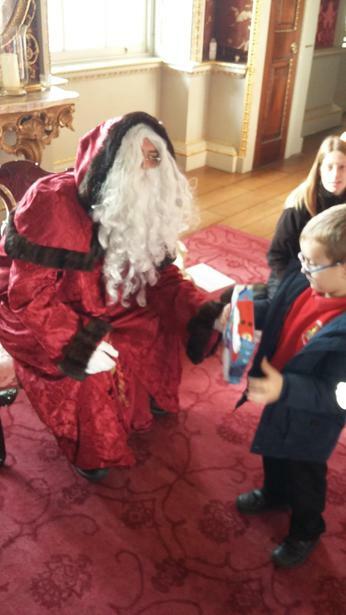 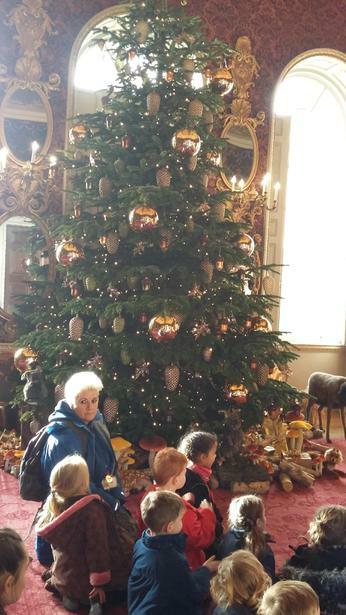 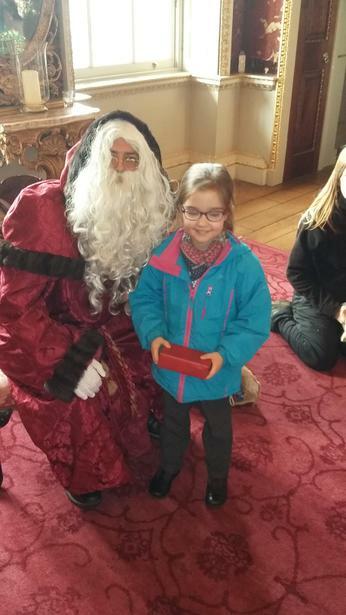 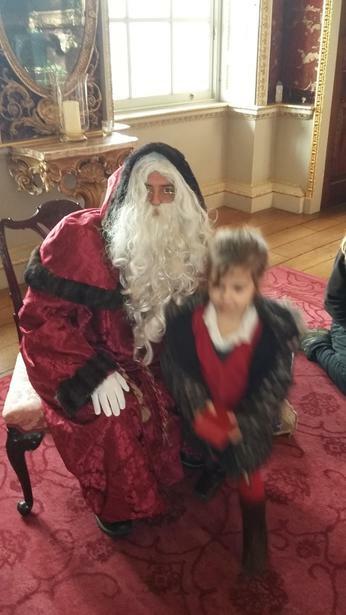 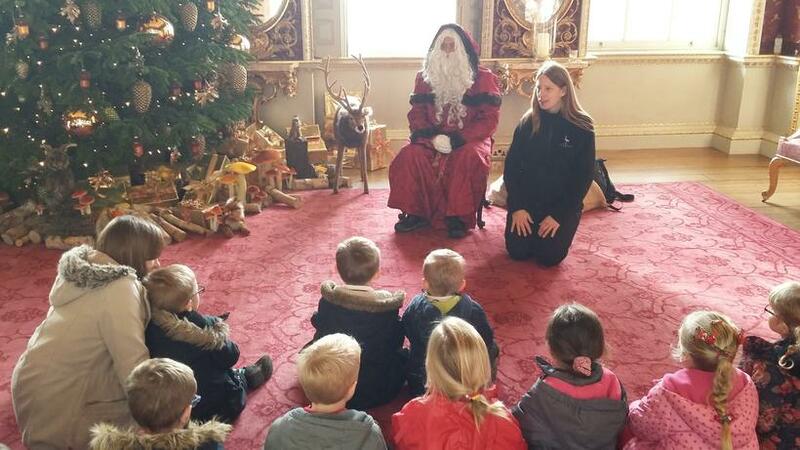 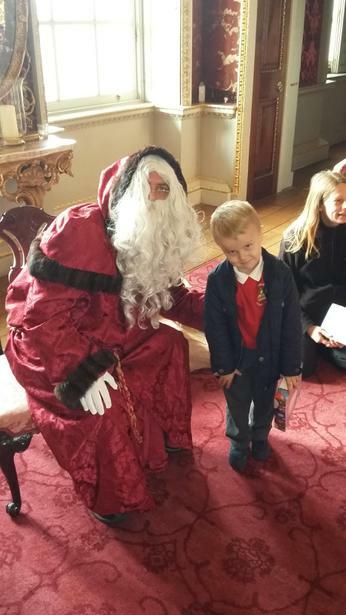 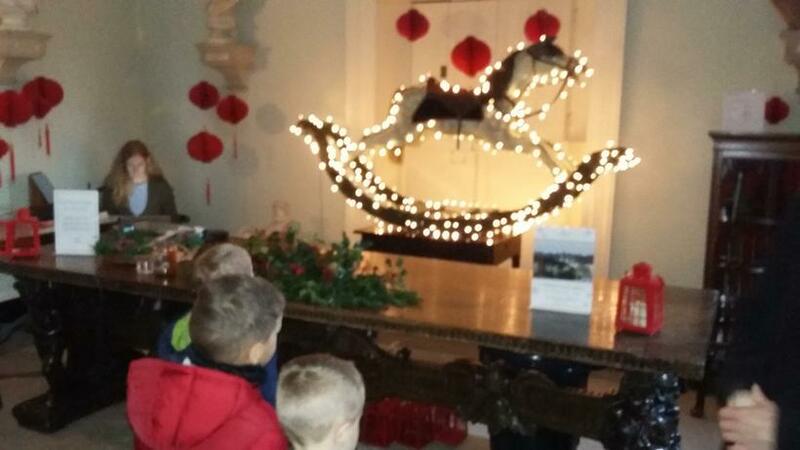 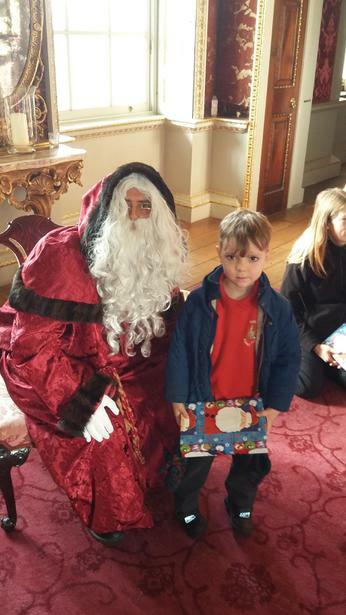 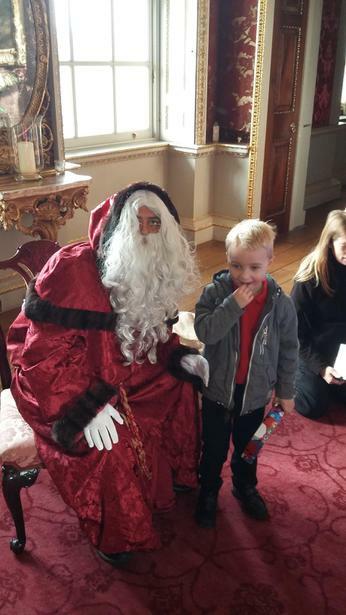 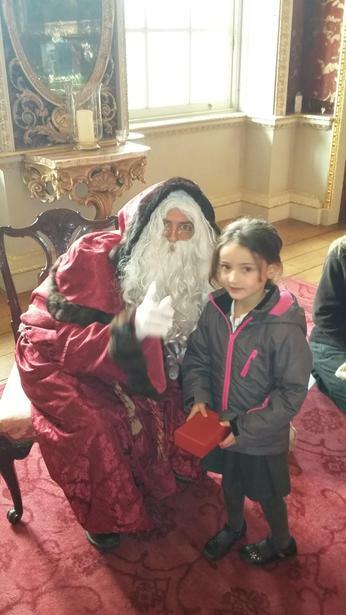 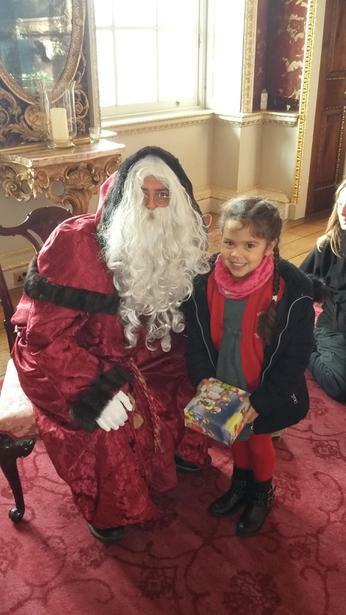 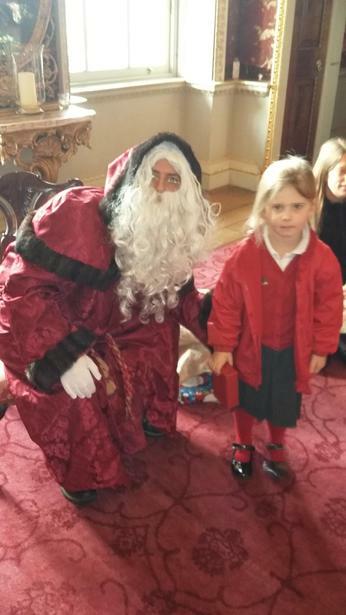 Ladybird class went on a very special school trip to Holkham Hall. 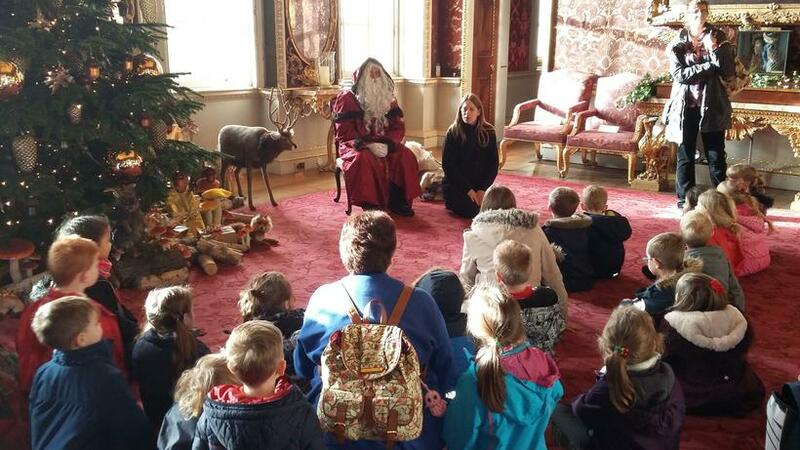 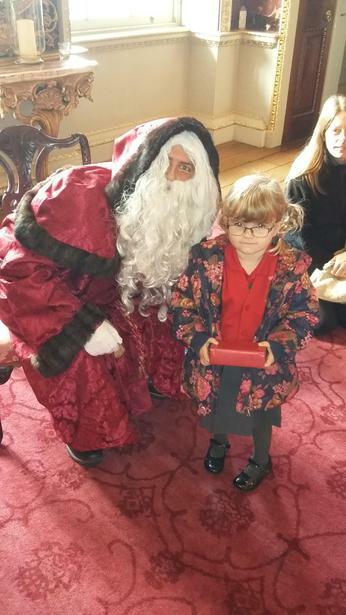 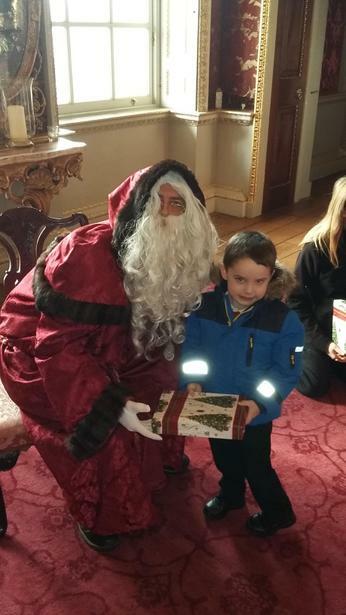 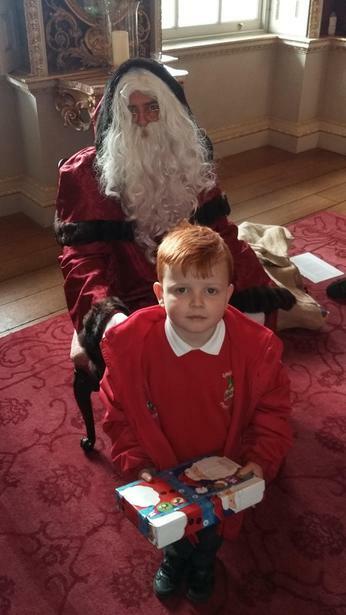 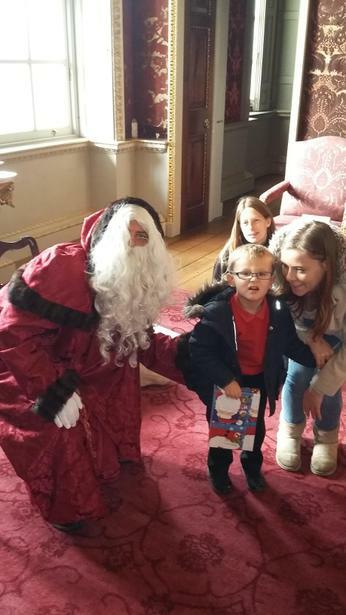 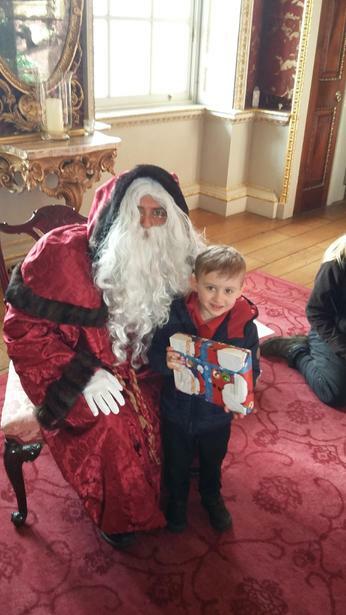 We explored the hall and admired all the beautiful Christmas trees and decorations, the children made a Christmas cracker and we met Father Christmas himself! 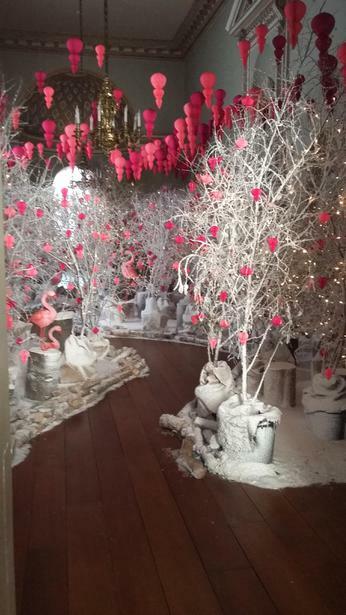 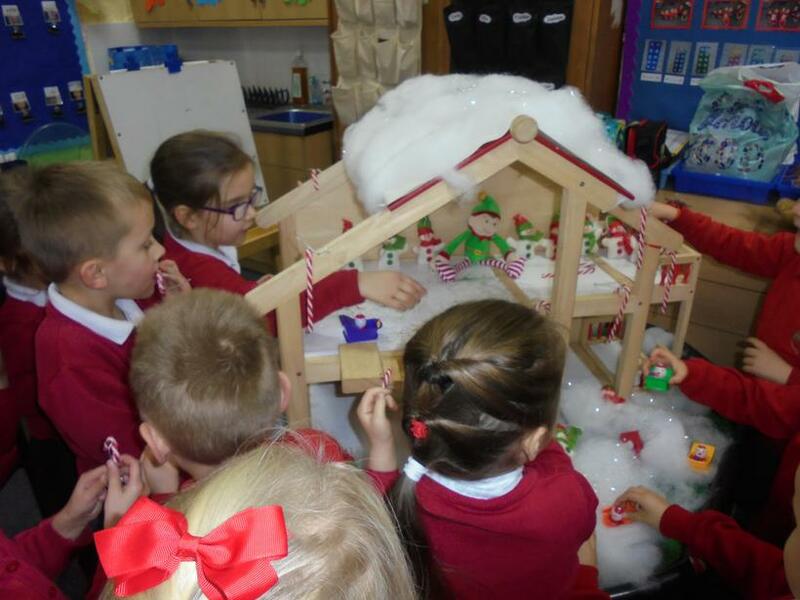 Our nativity this year was called Christmas Counts. 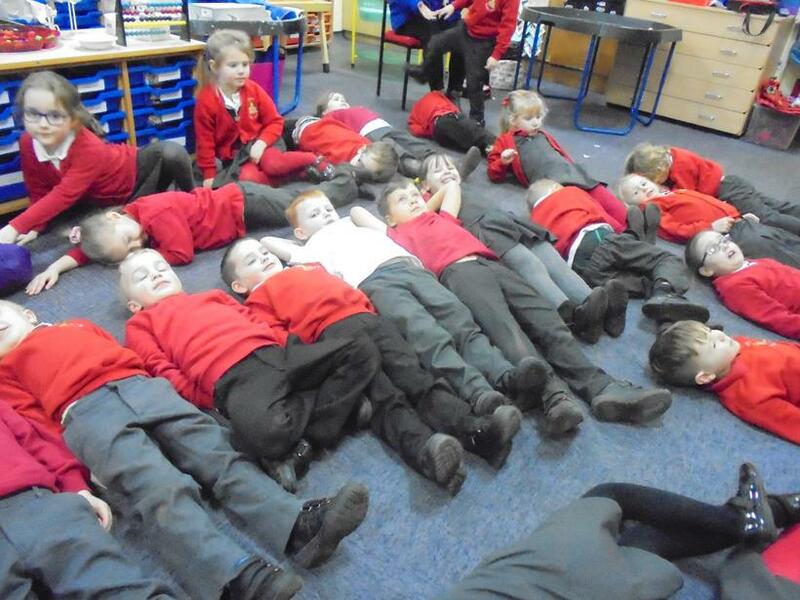 The children from Ladybird Class were all sheep and they looked fantastic! 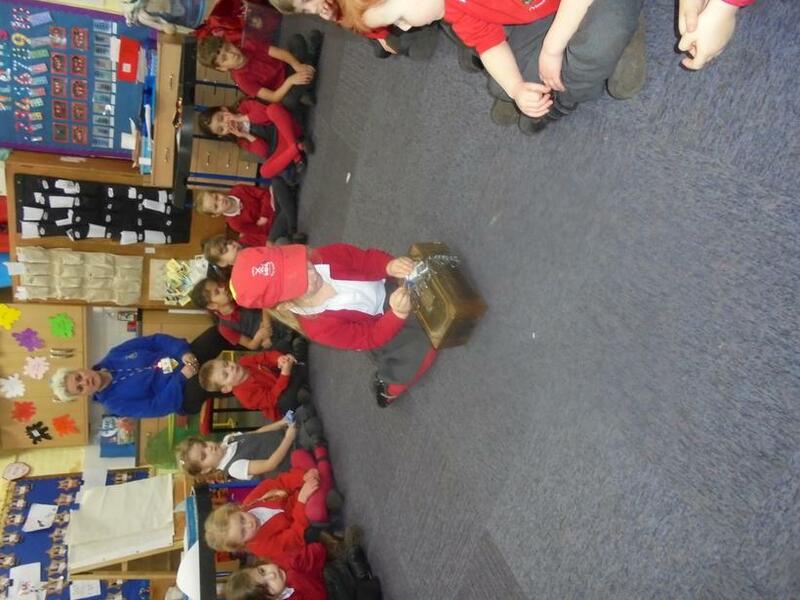 The performance went very well and we were so proud of all the children, especially those who had lines to learn. 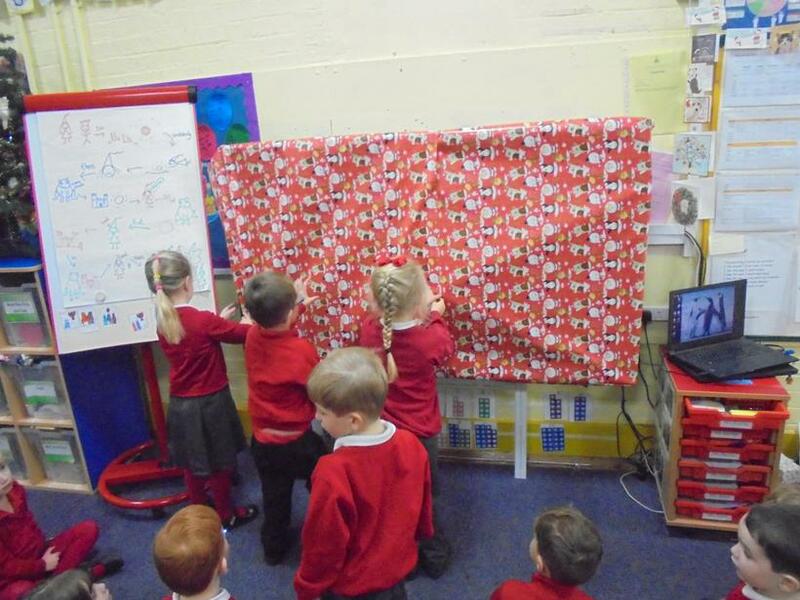 The dancing and singing was wonderful. 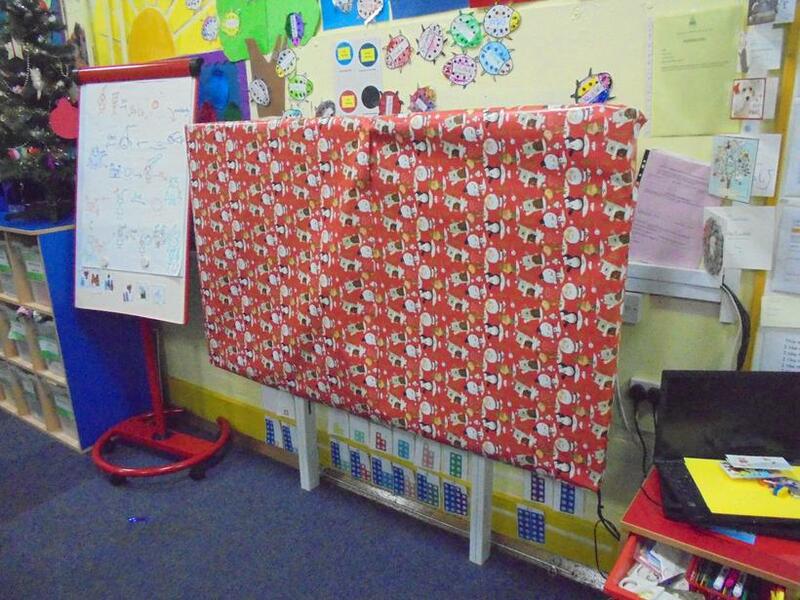 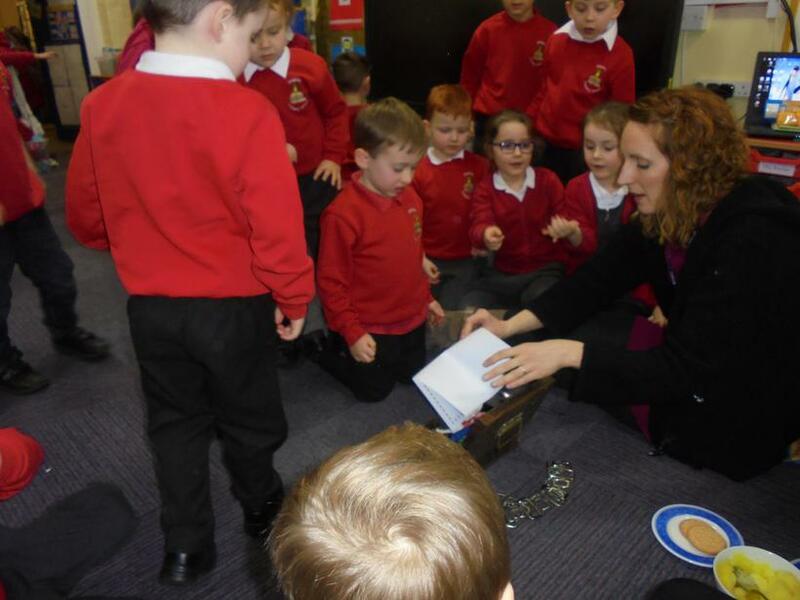 Many parents commented on how much the children had enjoyed being part of the nativity. 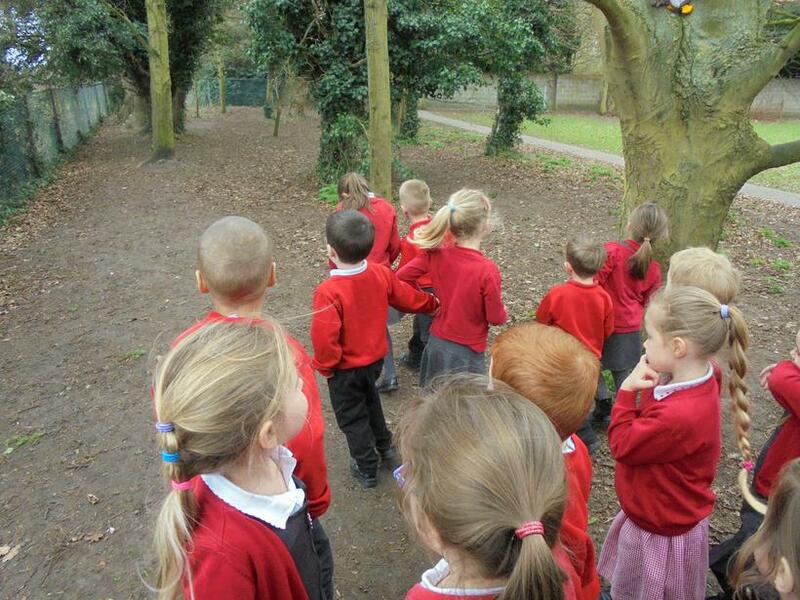 Ladybird class were joined by Hedgehog class and Fox class. 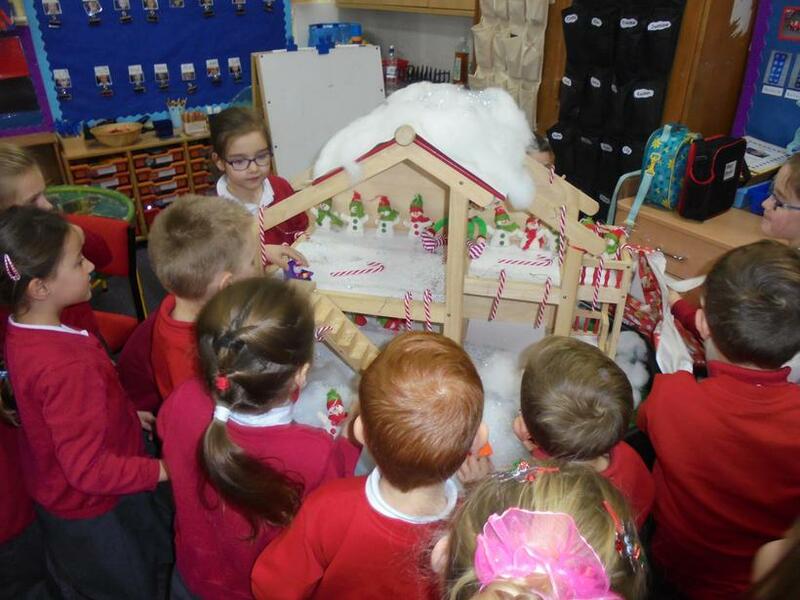 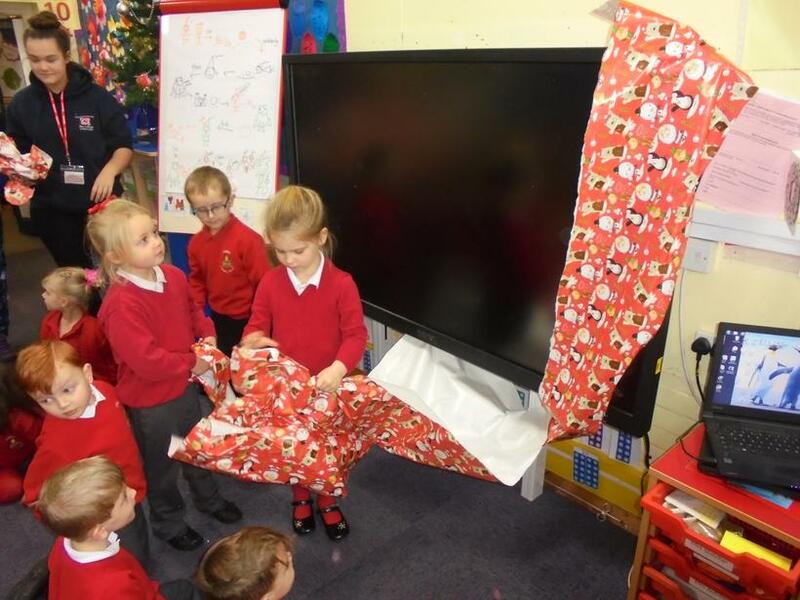 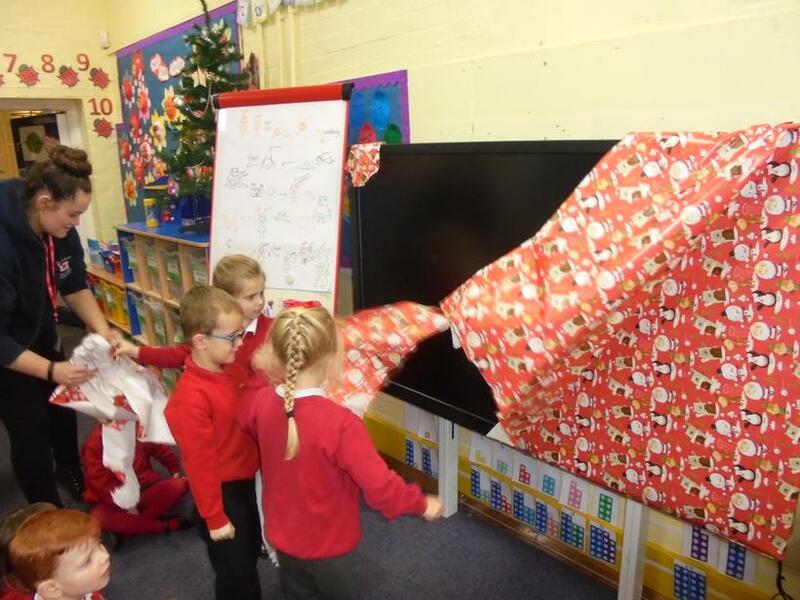 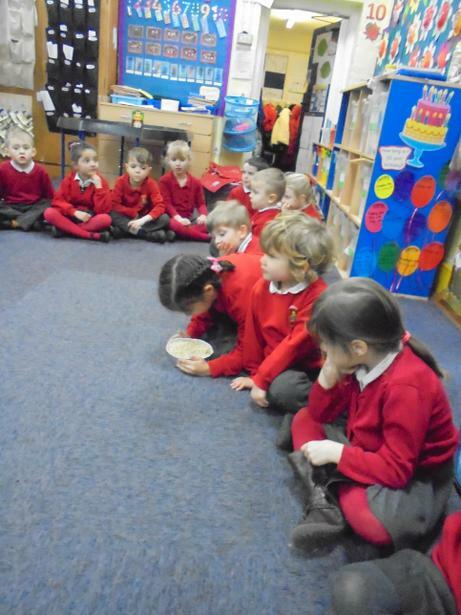 The Hedgehog class were Angels and the Fox class were the nativity characters. 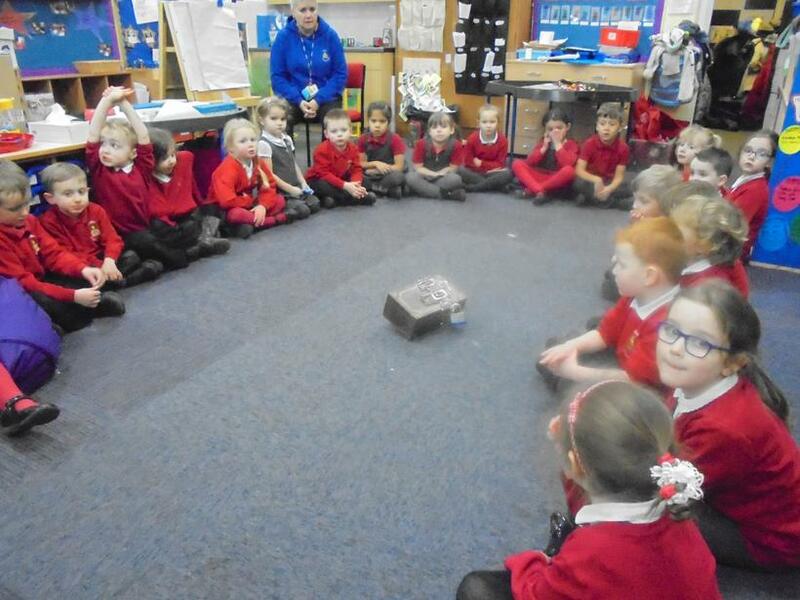 Take at look at Hedgehog class page for more photos. 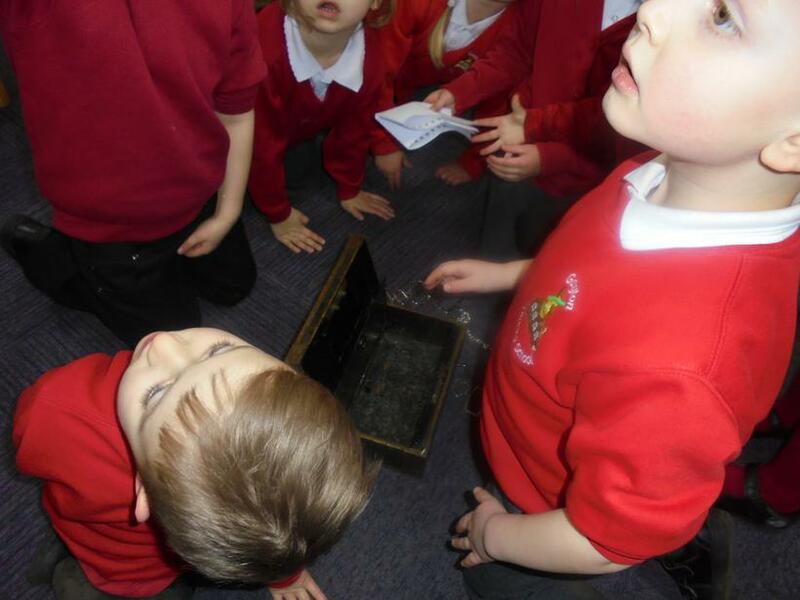 Today we found a key which had been trapped inside some ice. 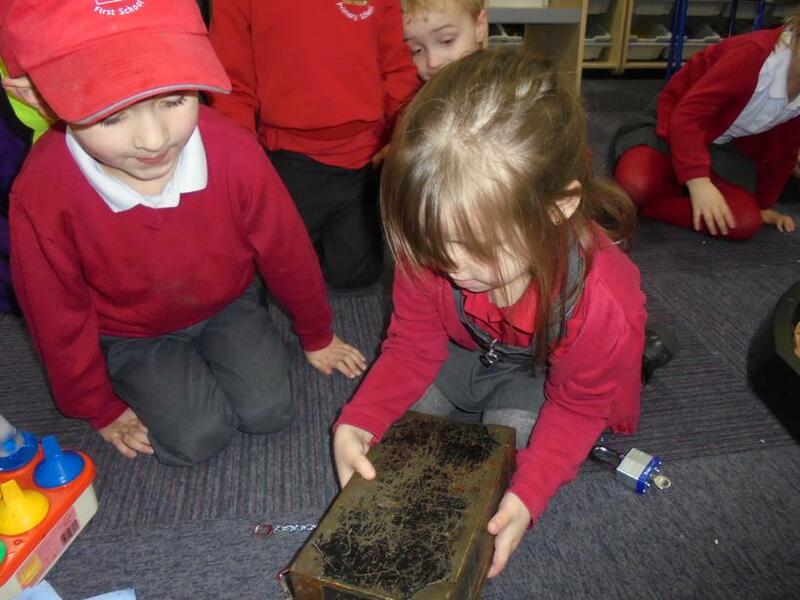 We all held the ice to see what it felt like and talked about how we could get the key out. 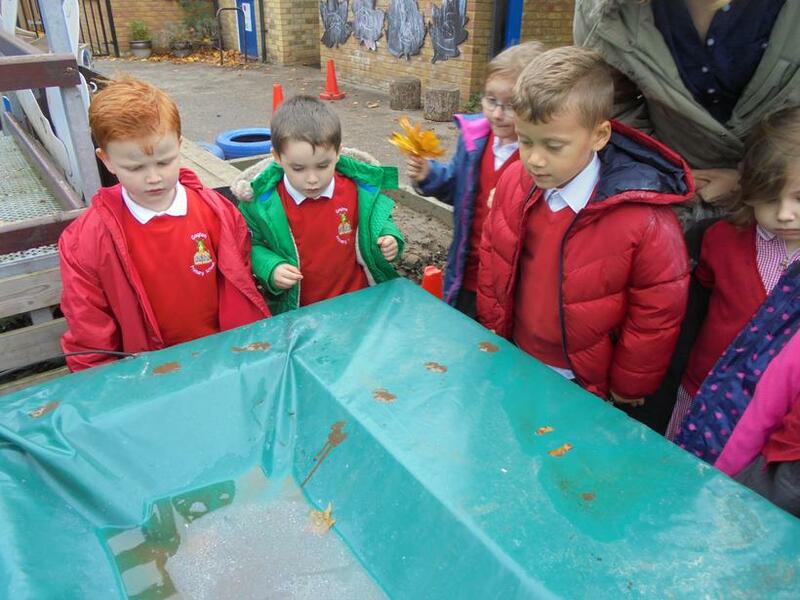 Some children thought the ice felt cold and hard. 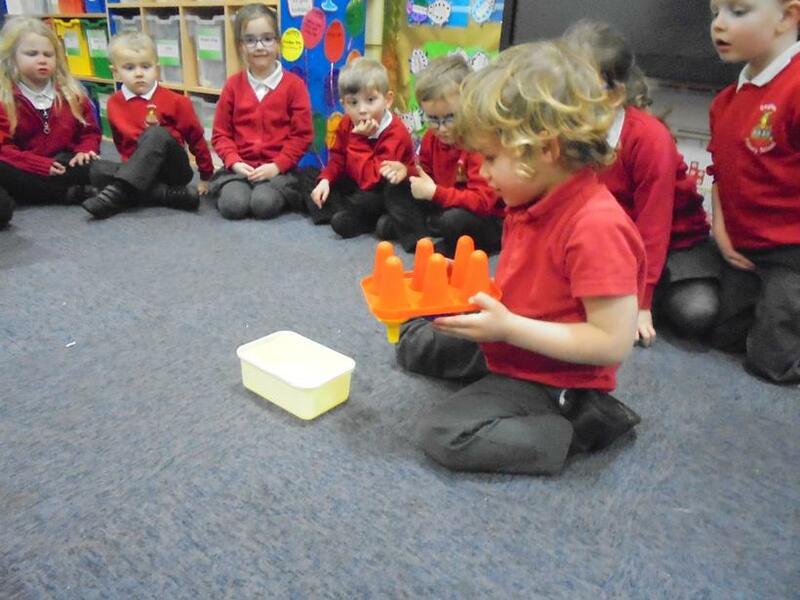 We were all very interested in the way our hands were suddenly wet after holding the ice. 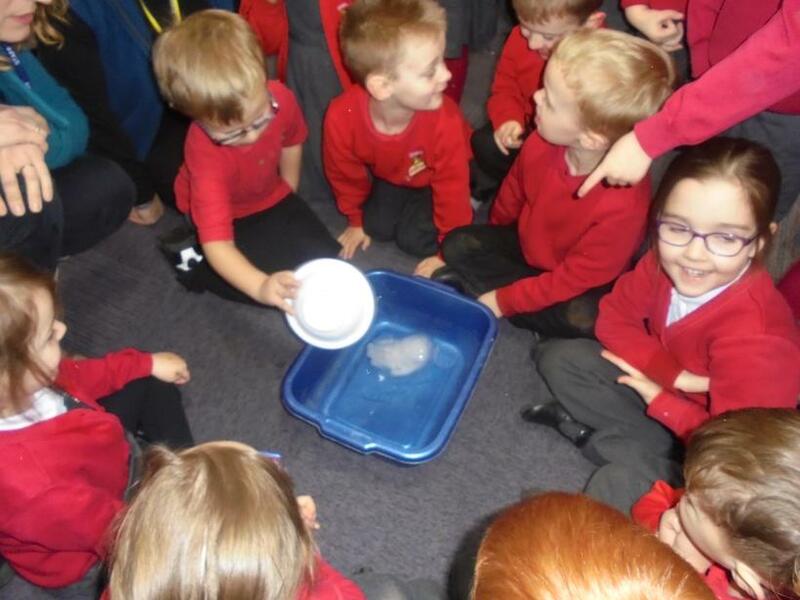 We decided it would be best to melt the ice rather than try smashing it so we discussed different ways of melting things. 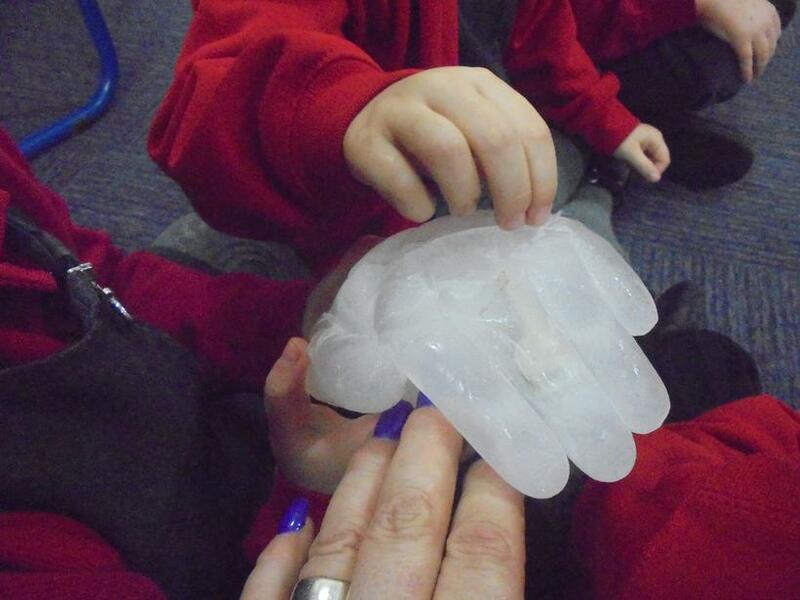 Some children wanted to hold it until it melted but that made our hands too cold. 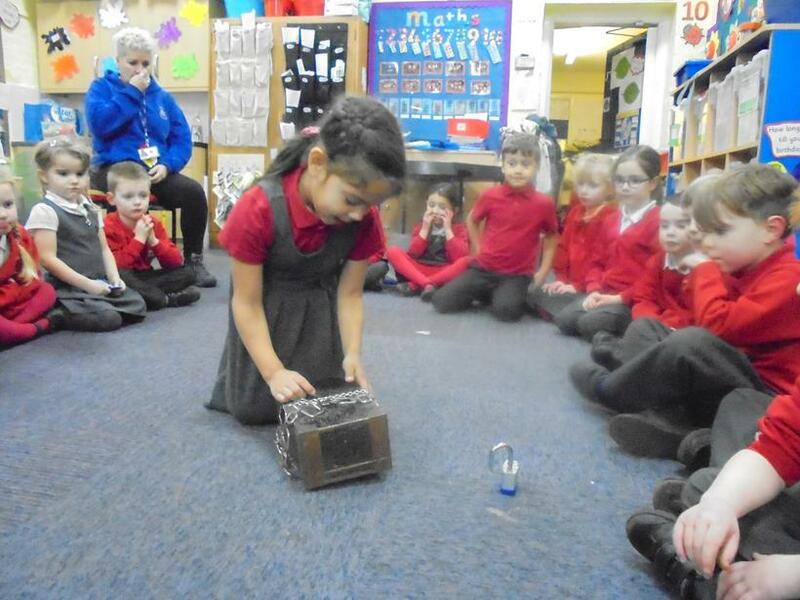 Morgan decided we should put it near the heater, that worked very well. 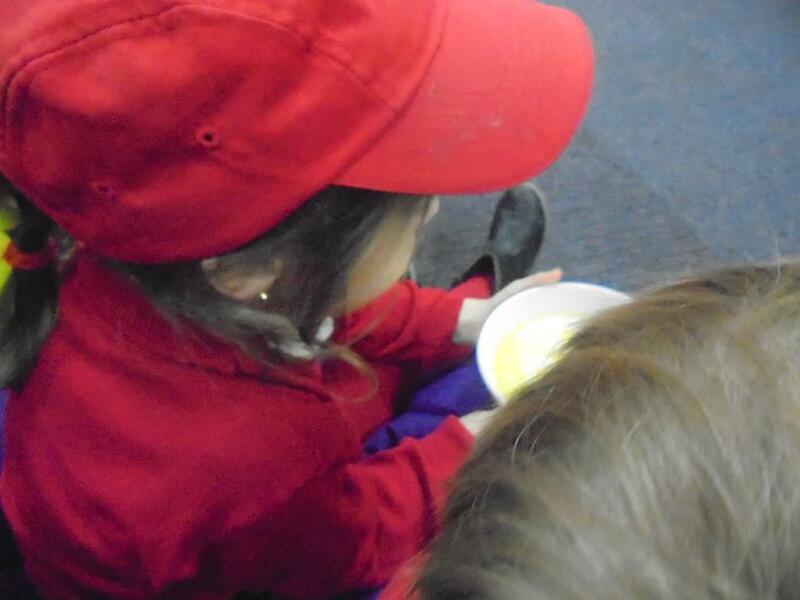 While the ice was melting we talked about other things that melt. 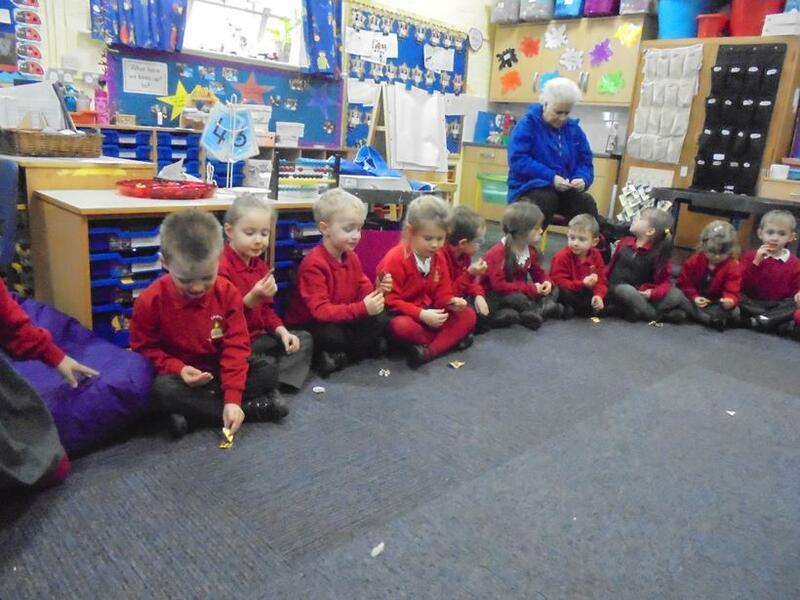 We thought of lots of things including snow, ice cream, jelly, cheese, wax crayons, candles and of course CHOCOLATE! 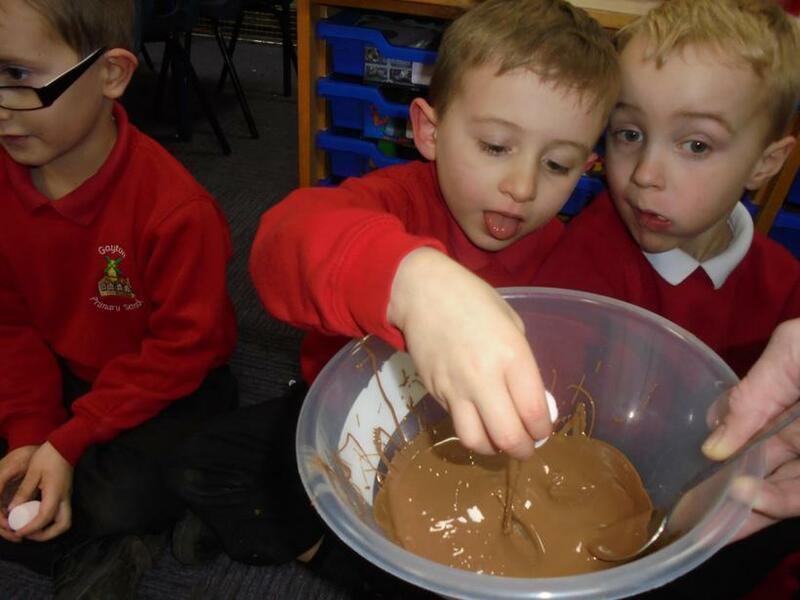 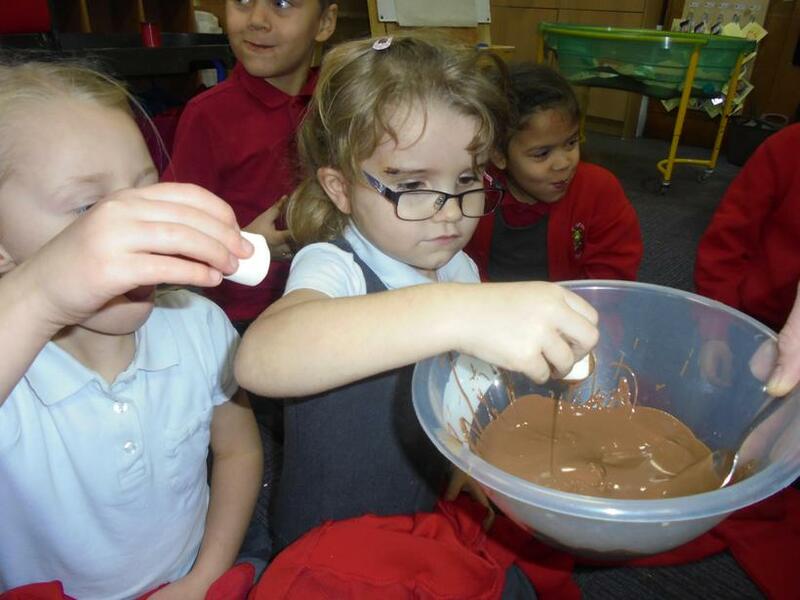 We thought that all these things needed heat to melt them so we tested this by putting chocolate in the microwave. 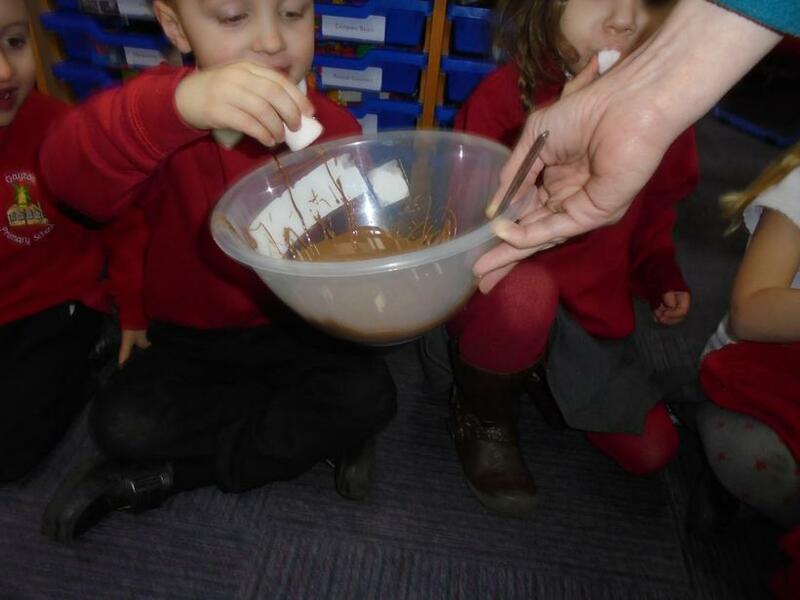 This made the chocolate go runny so to tidy up we ate it with marshmallows, yum. 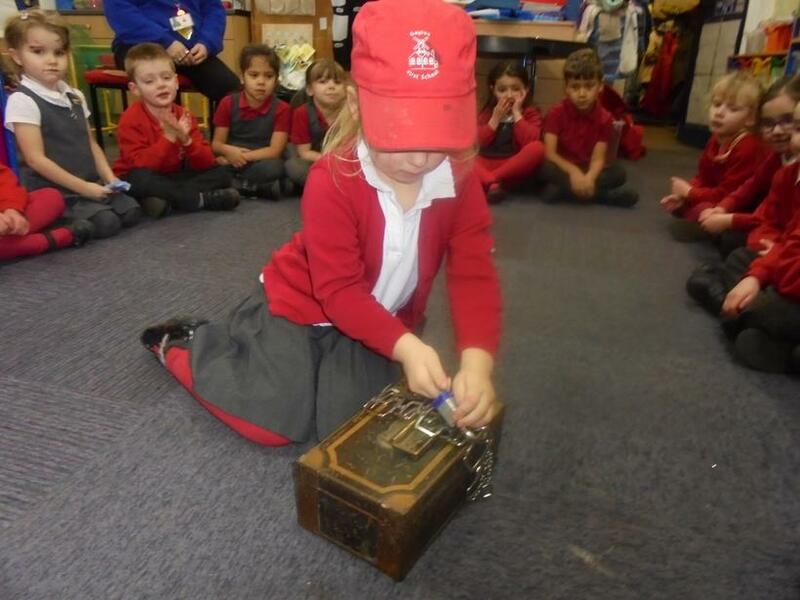 When the key is free we are going to find out what it unlocks! 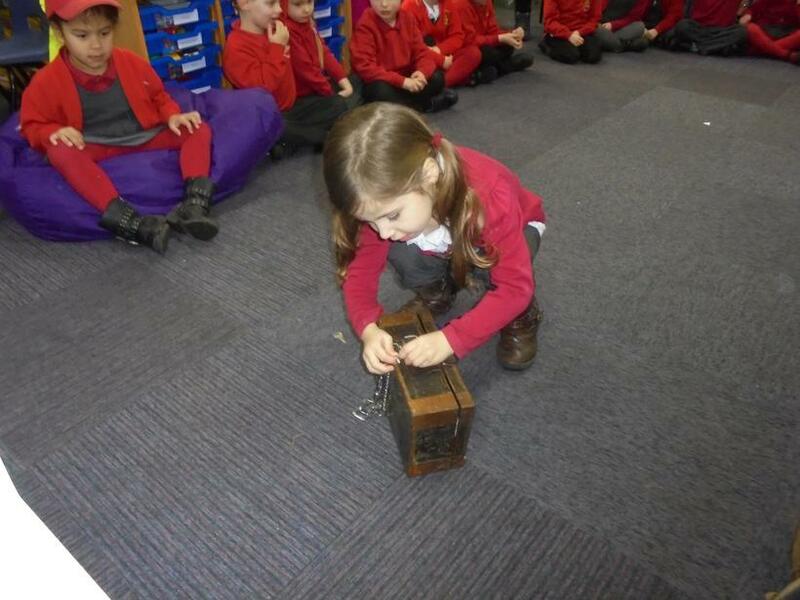 Today there was a treasure chest in our school. 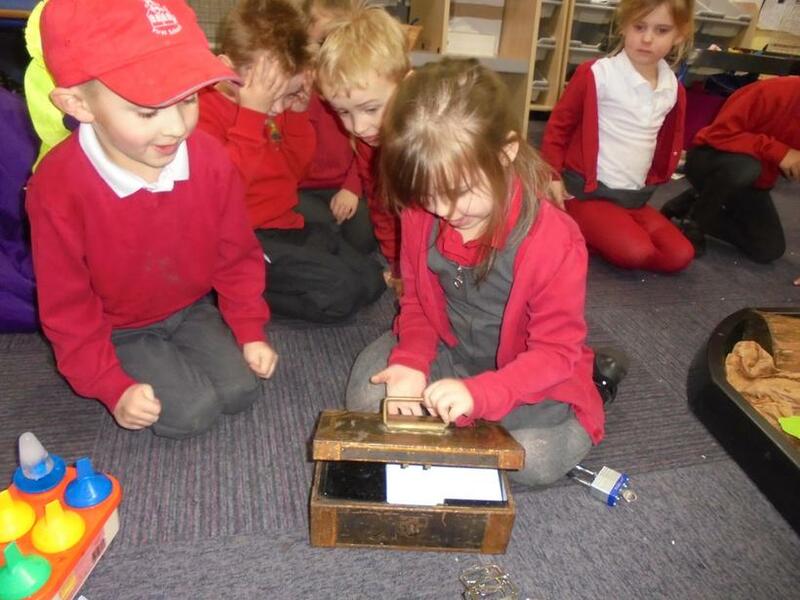 We used the frozen key to unlock it and found a note inside. 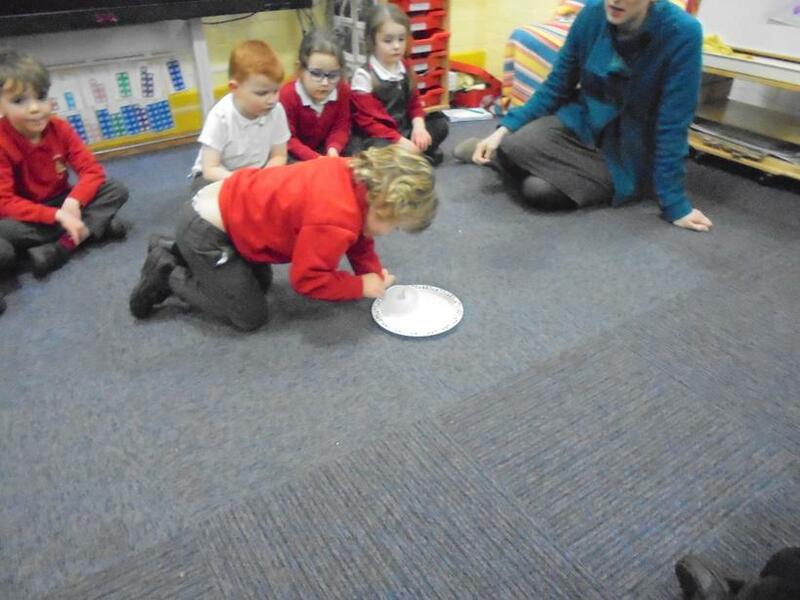 We talked about how we could make water hard and Joel suggested that we put it in the freezer. 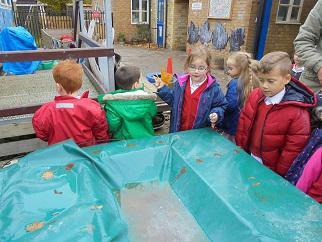 We put a bowl of water in the freezer and a bowl of water outside. 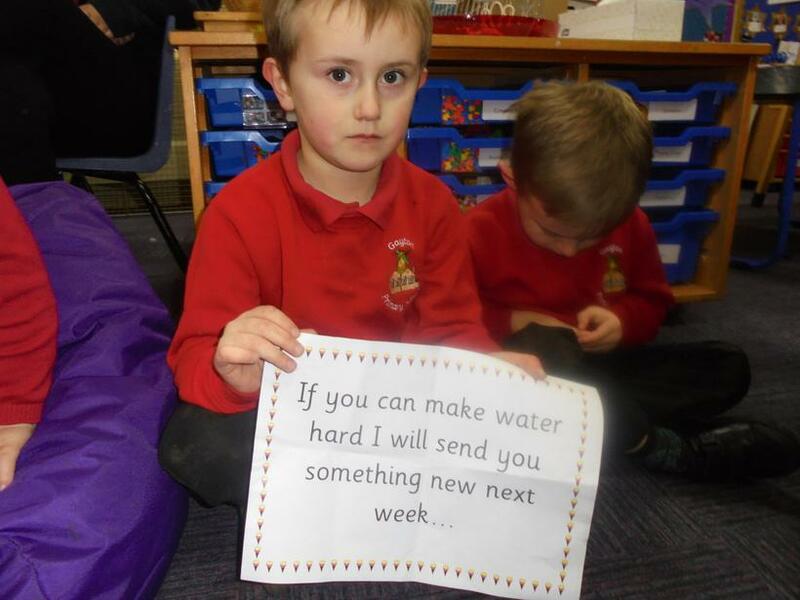 I wonder which will go hard? 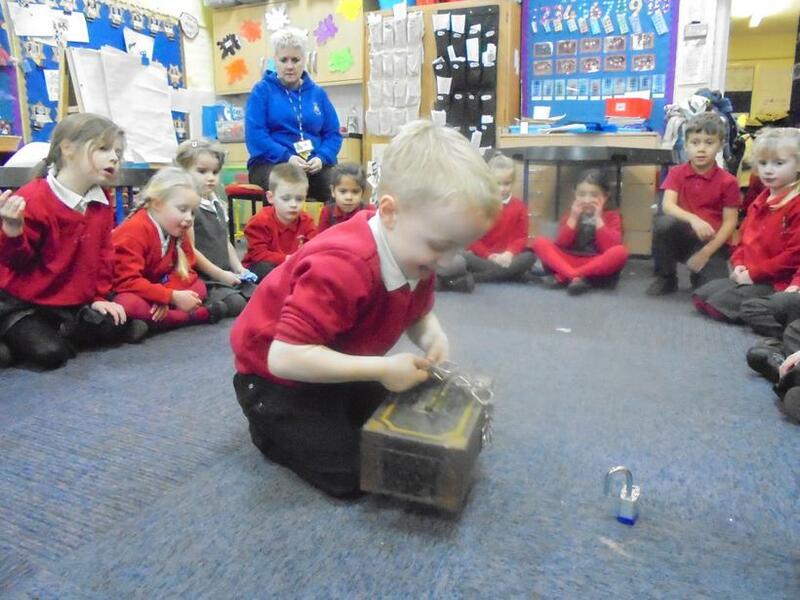 The key appeared again today, this time it was inside a frozen hand! 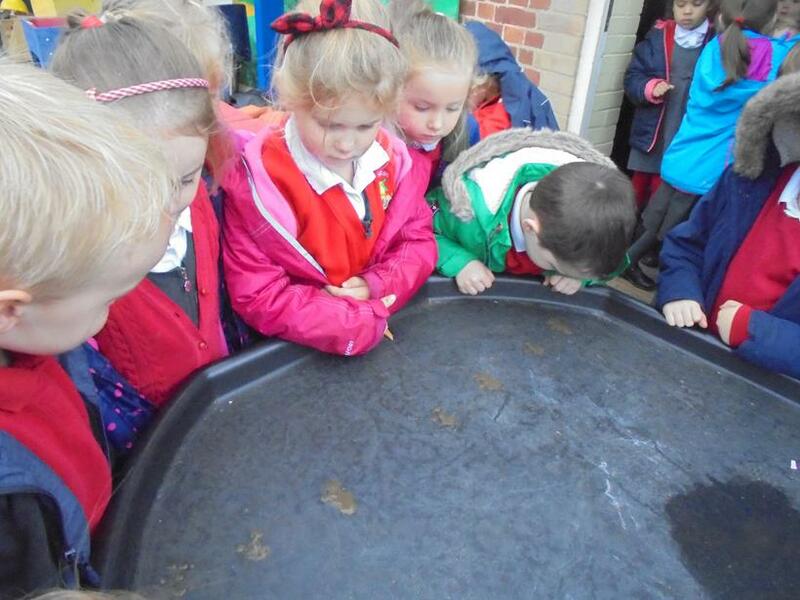 We passed it round the circle, it was really cold. 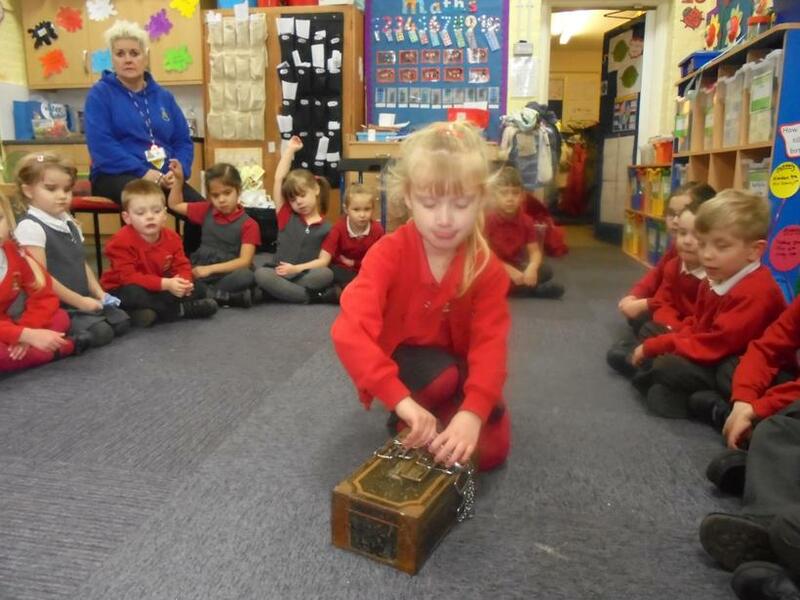 The key didn't start to melt until half the class had held it, we know this because the first few children that held it didn't get wet hands. 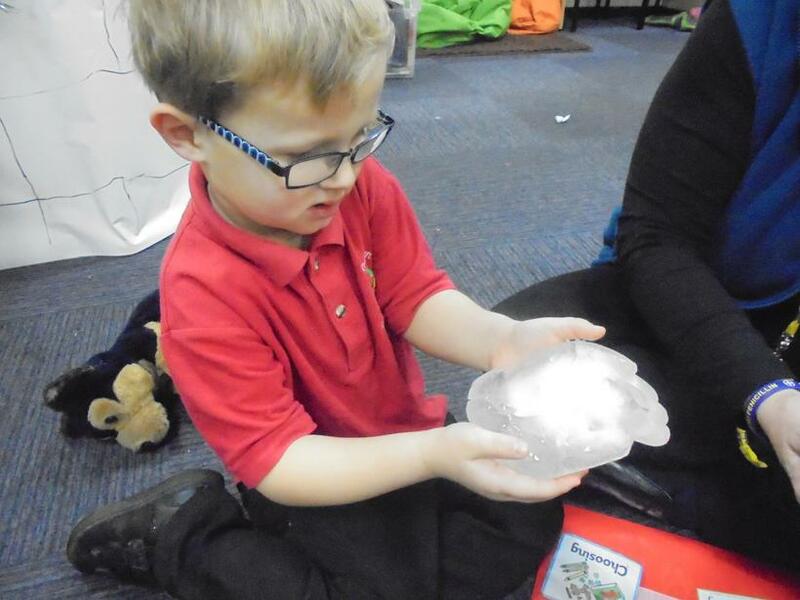 We decided to melt it by putting the ice hand into a bowl of warm water. 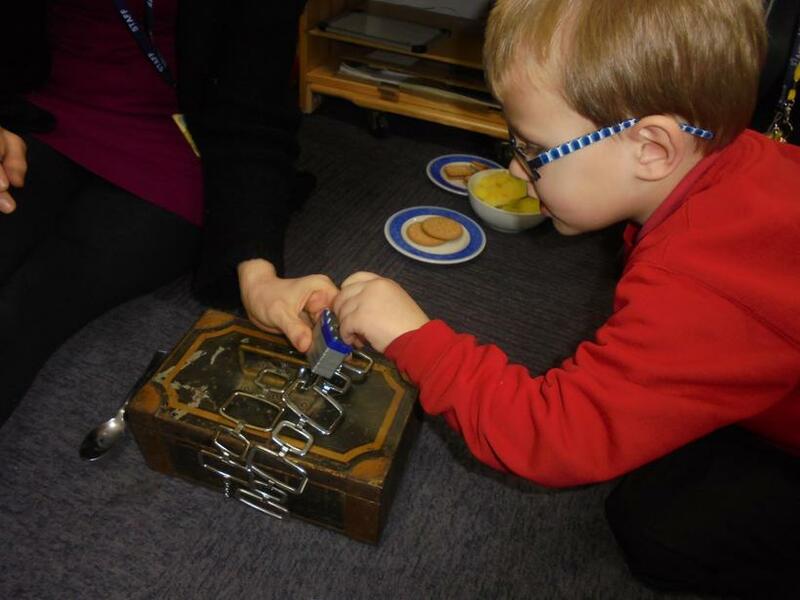 It melted very quickly and the key fell out. 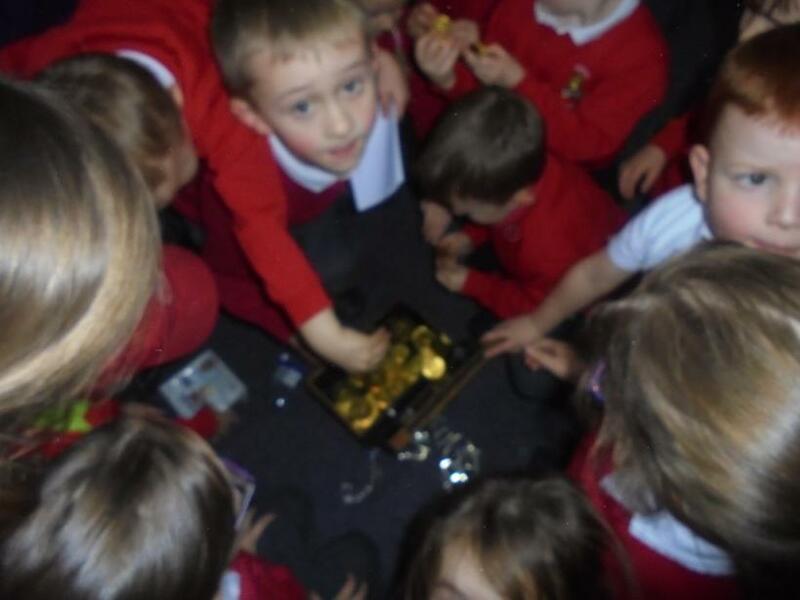 We unlocked the treasure chest and inside we found some gold and a CD, a note told us to listen to the CD and try to follow the story. 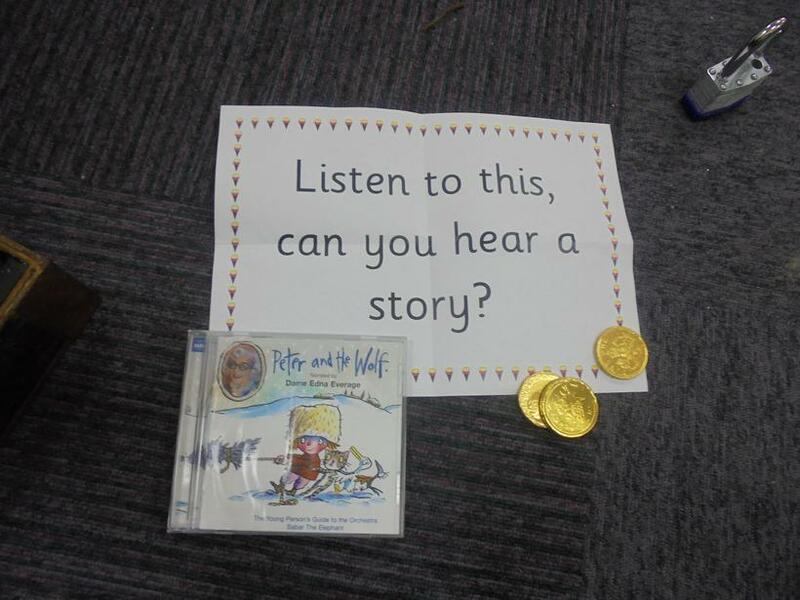 It was 'Peter and the Wolf', we enjoyed listening to the music and imagining the story. 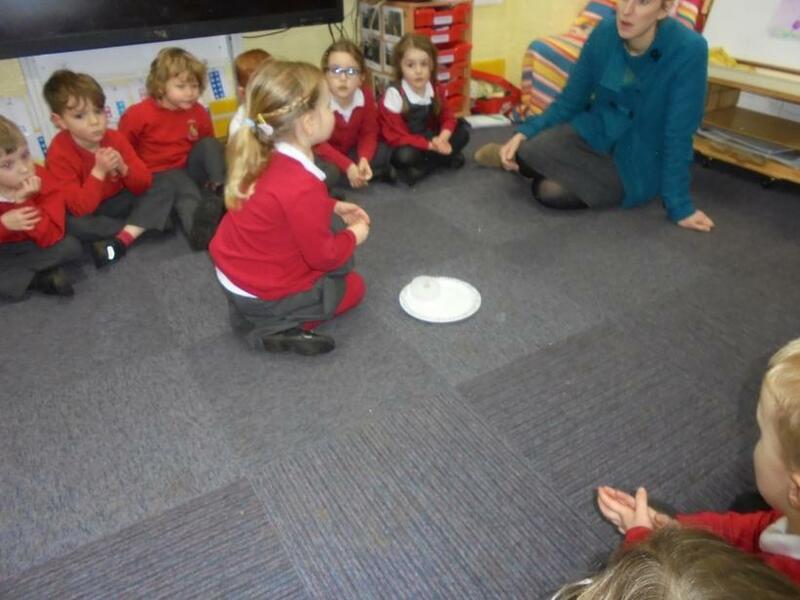 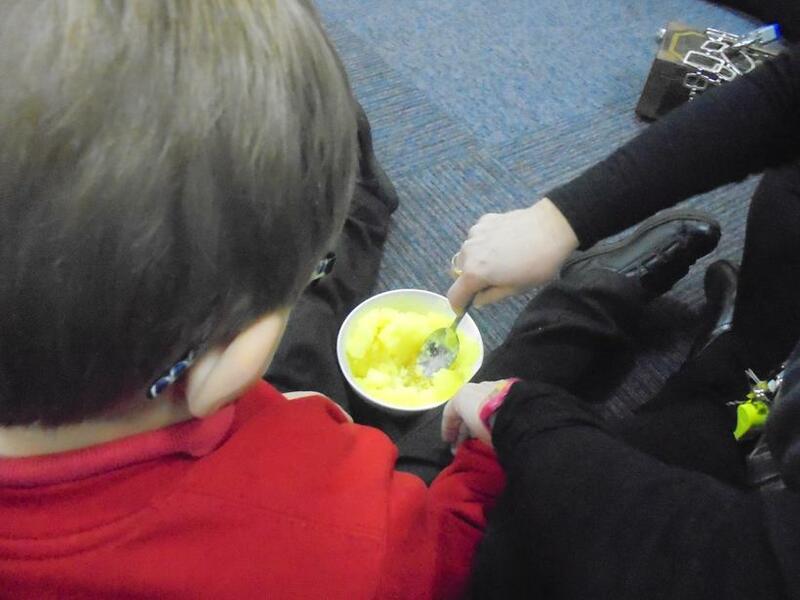 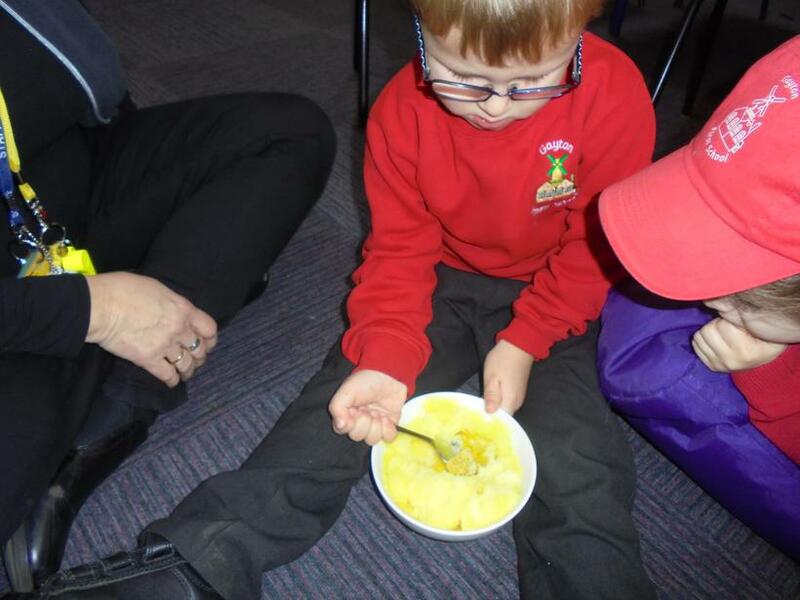 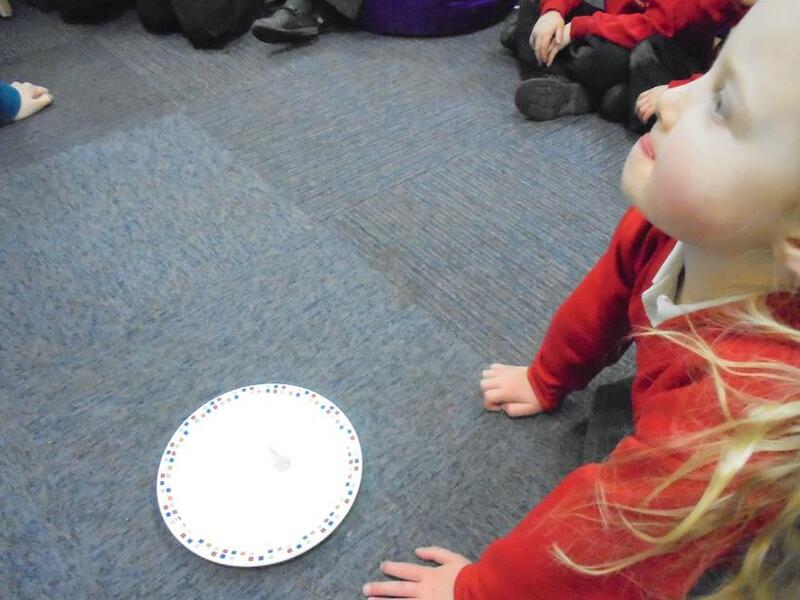 Today we found a bowl of something which was yellow and frozen, we all had a look at it and tried to guess what it was. 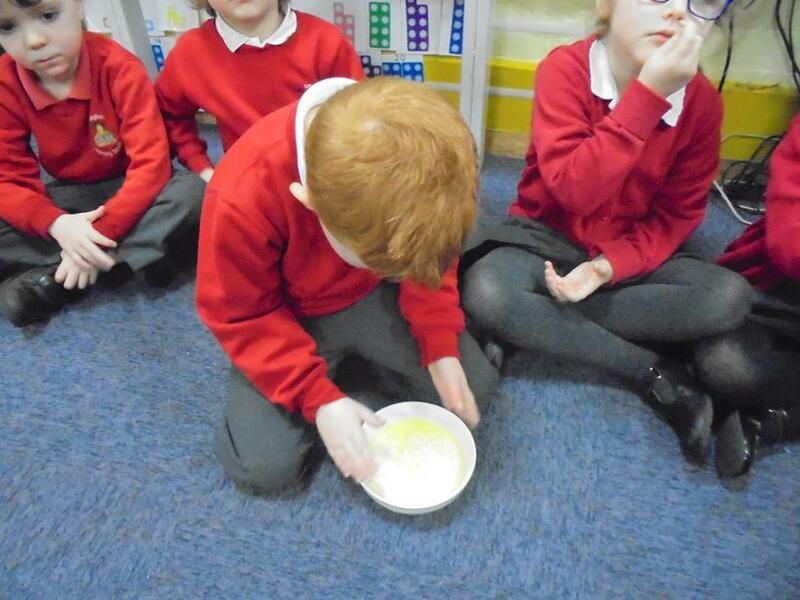 Some children thought it was orange juice, others thought it was jelly, a couple guessed it was marshmallows or soap. 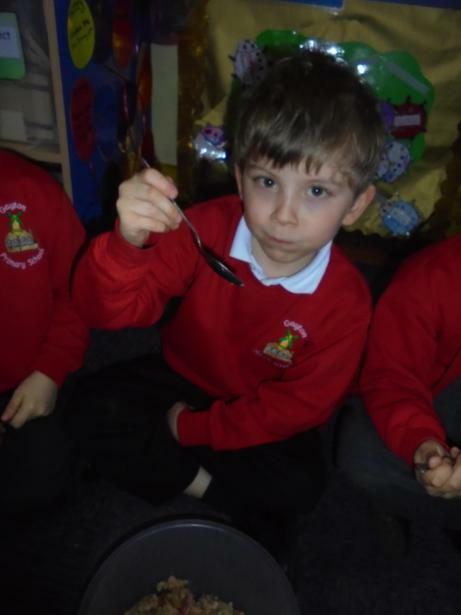 We used a spoon to try and break it up so that it would come out of the bowl. 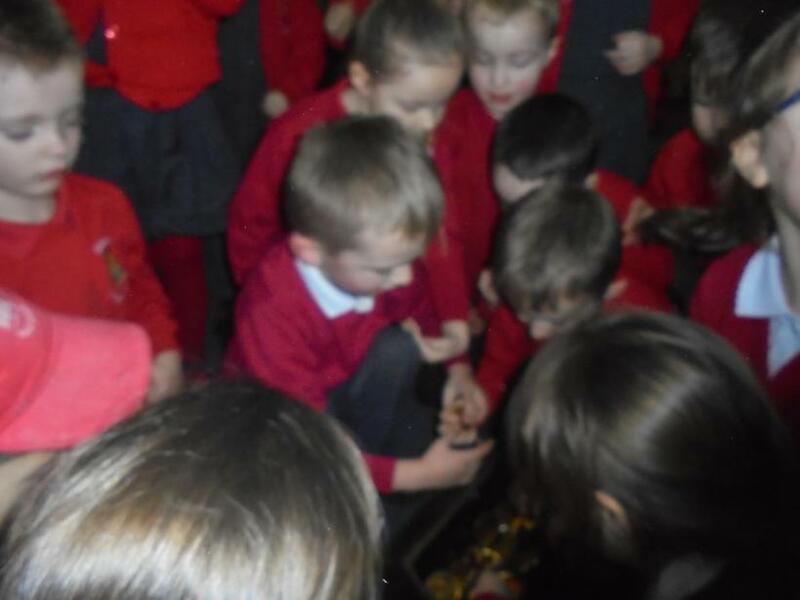 Eventually it did and at the bottom we found the key! 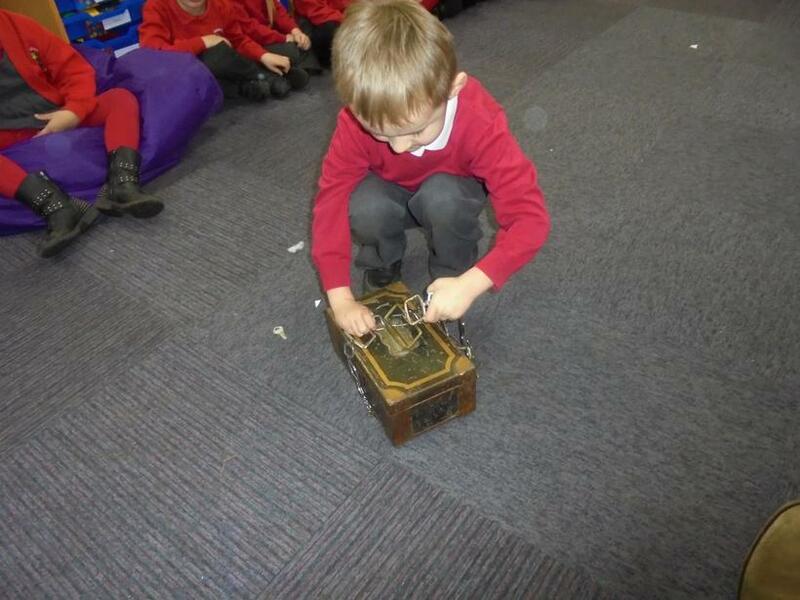 Cody used the key to unlock the treasure chest. 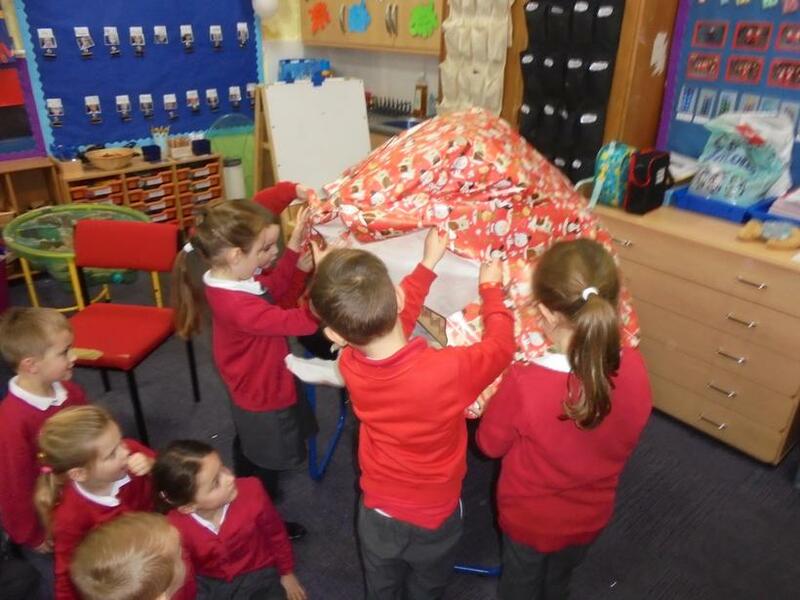 This time there were some instructions inside and some balloons. 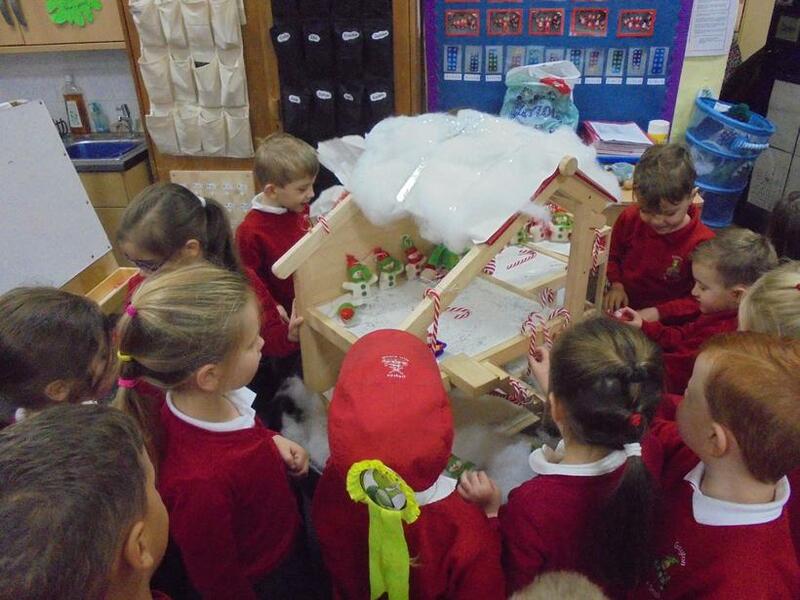 Mrs Butcher followed the instructions to make giant ice marbles, Ella and Teddy helped. 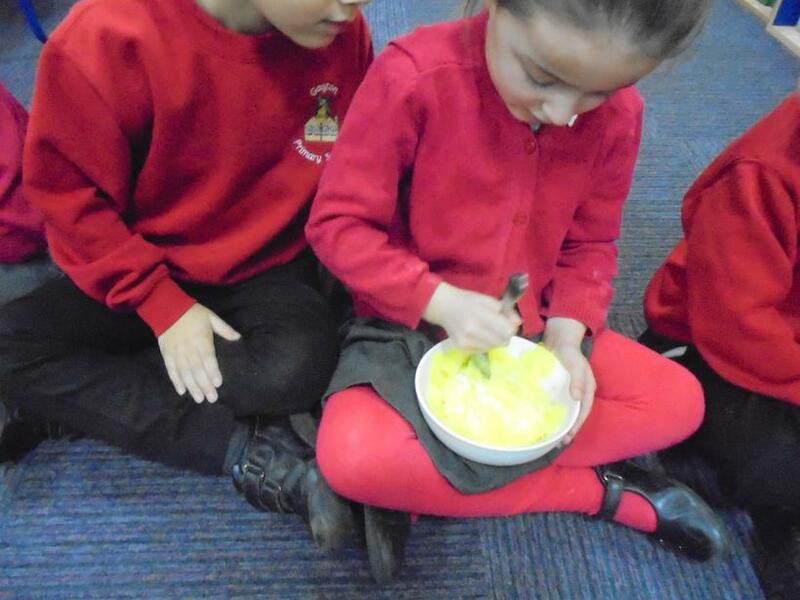 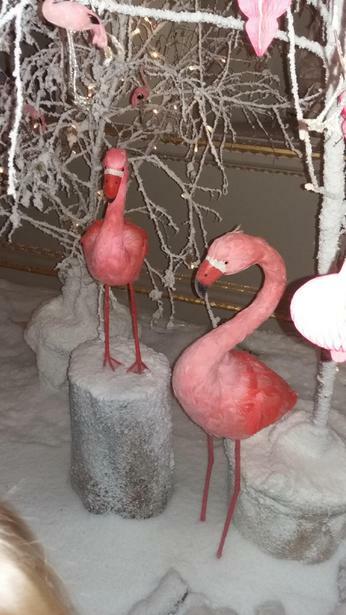 They then put them in the freezer. 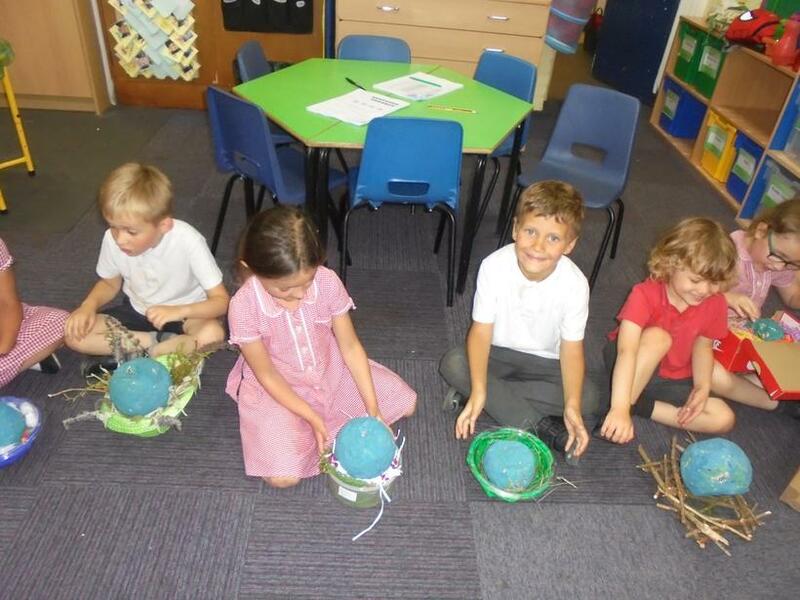 Next week if if gets cold enough we will make some more and leave them outside. 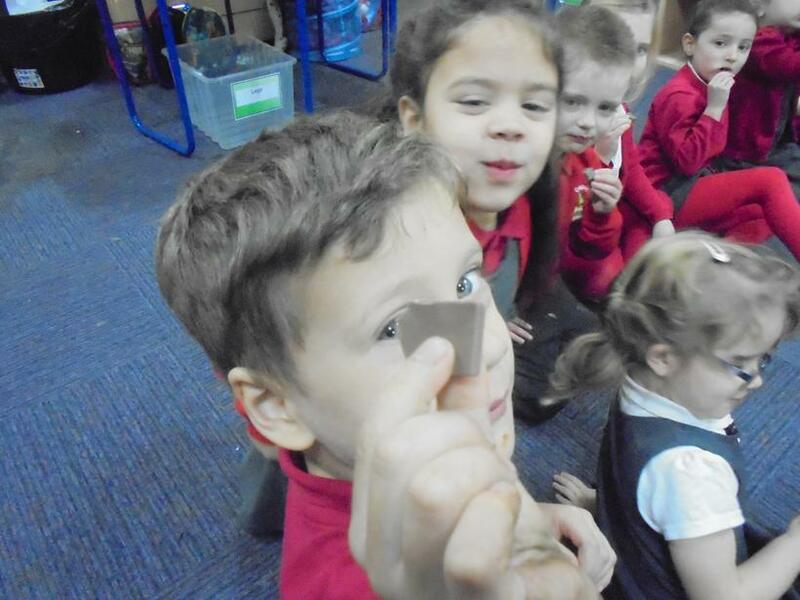 Today we found the key frozen inside an ice lolly! 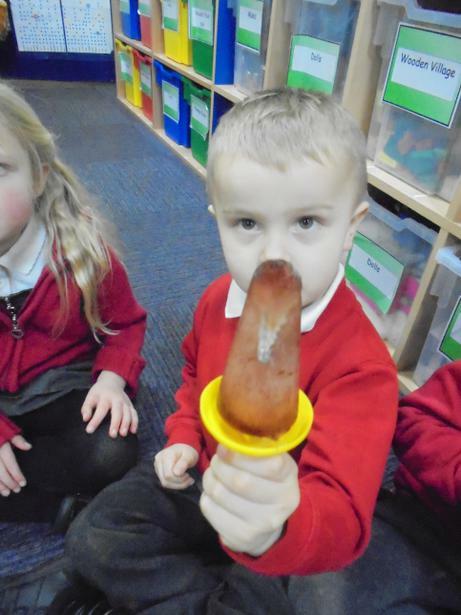 There were 6 ice lollies, 5 of them were plain but one was a funny purple colour and smelt strange. 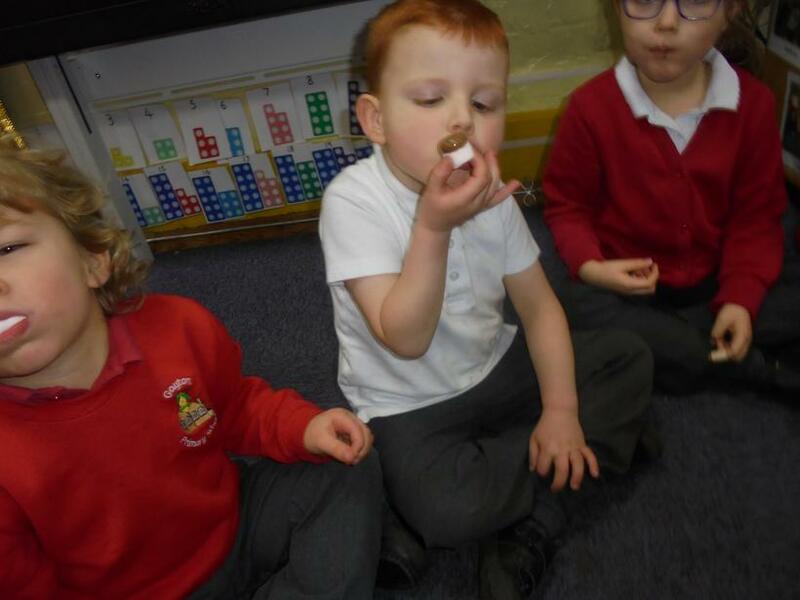 We decided not to lick the lollies because we didn't know where they had come from. 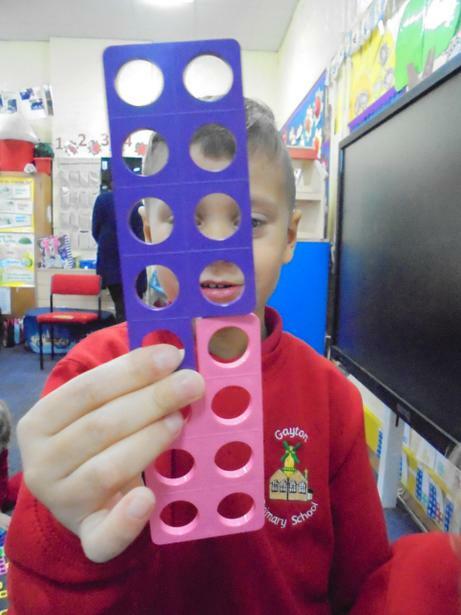 We left the purple one to melt and then the key came out. 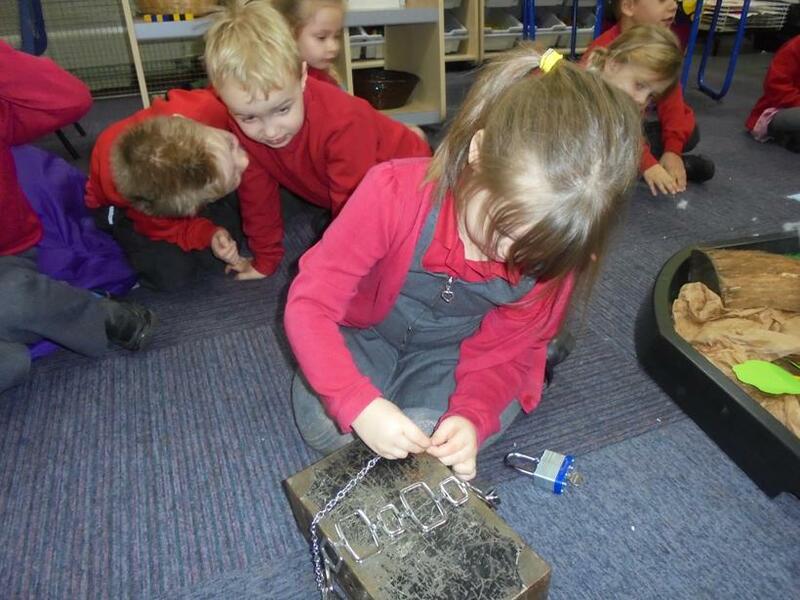 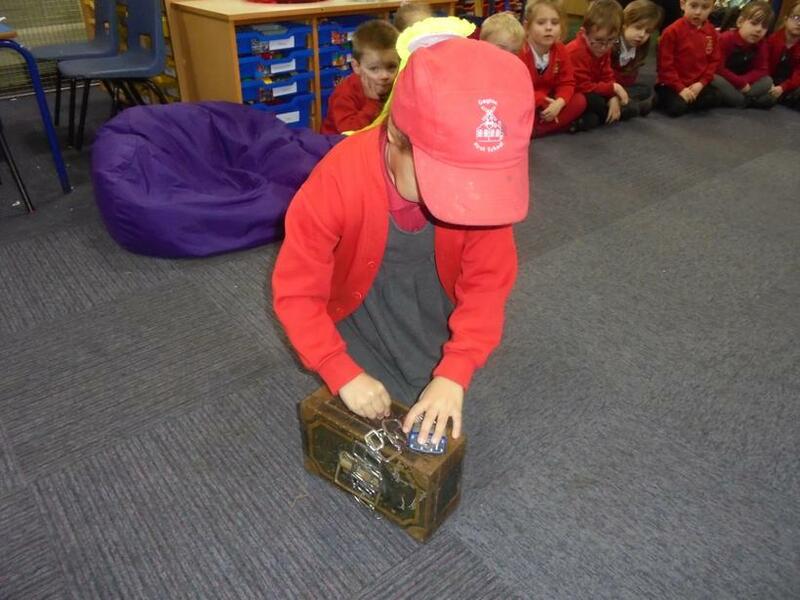 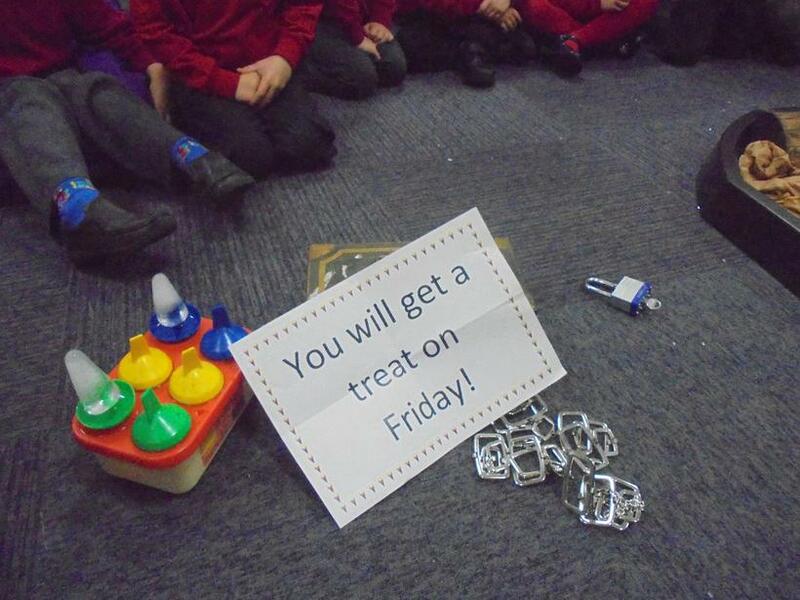 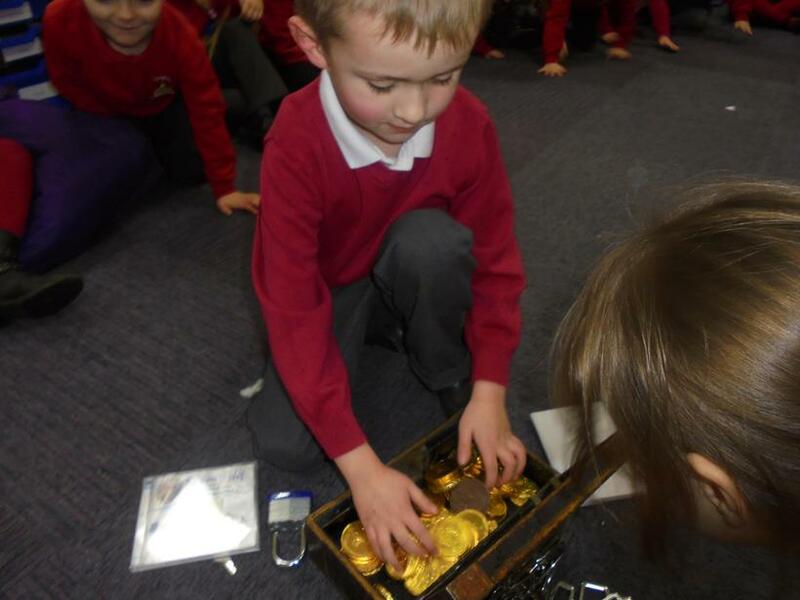 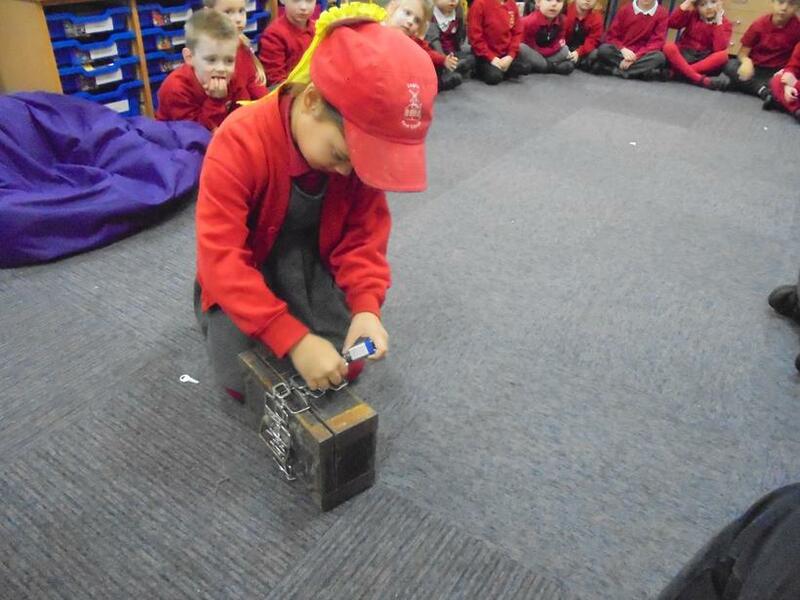 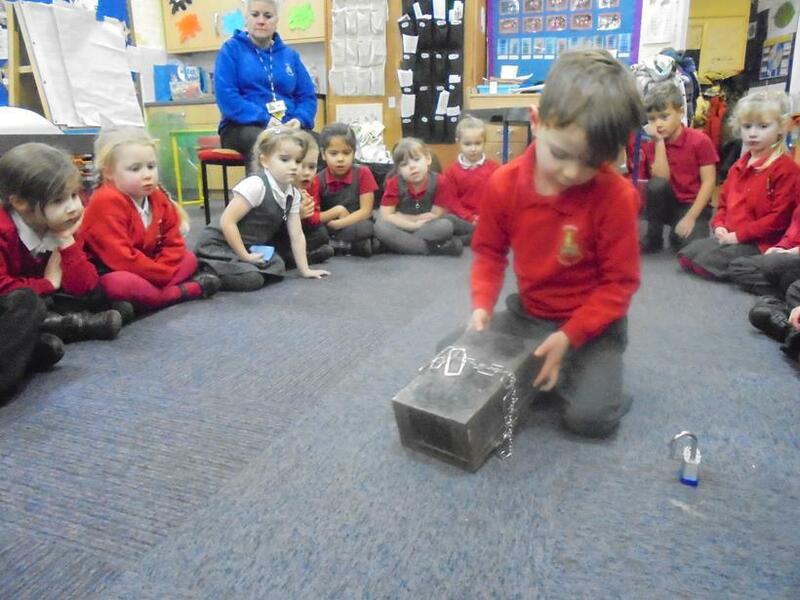 Inside the treasure chest we found a note which said that we will get a treat on Friday. 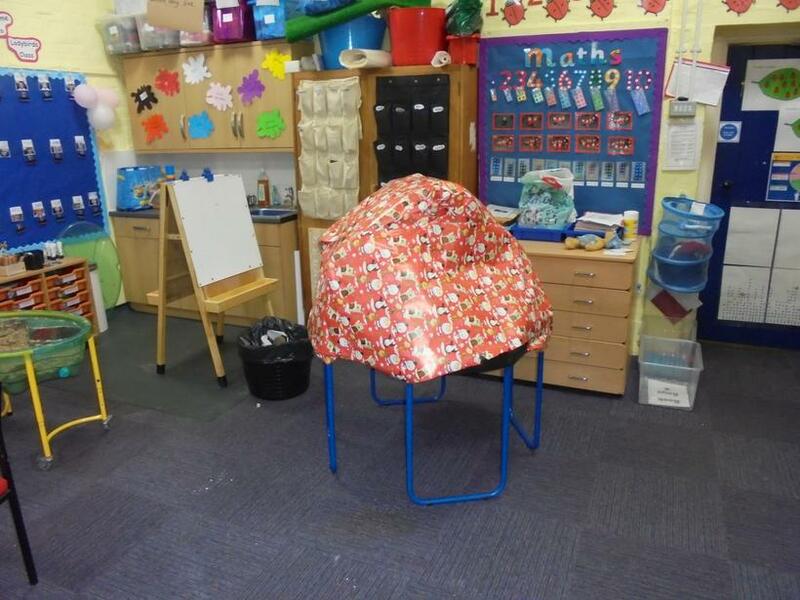 I wonder what it will be...? 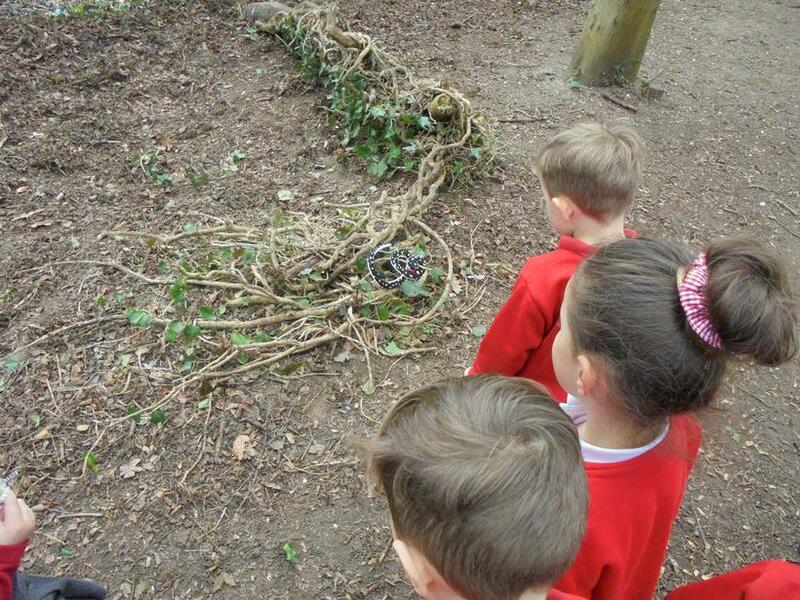 We went to the woods to look at the wildlife but found some strange things which weren't there at lunch time. 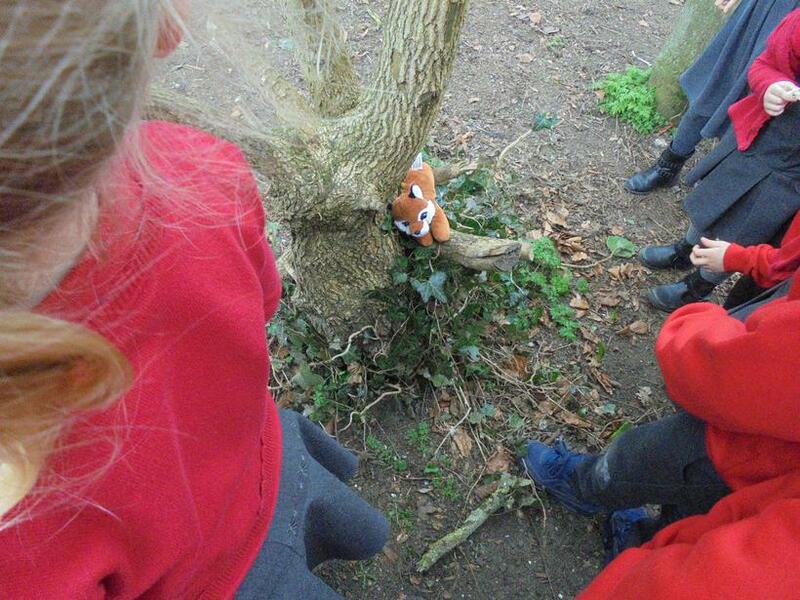 First we saw a snake in a log pile house, then an owl in a tree top house and then a fox. 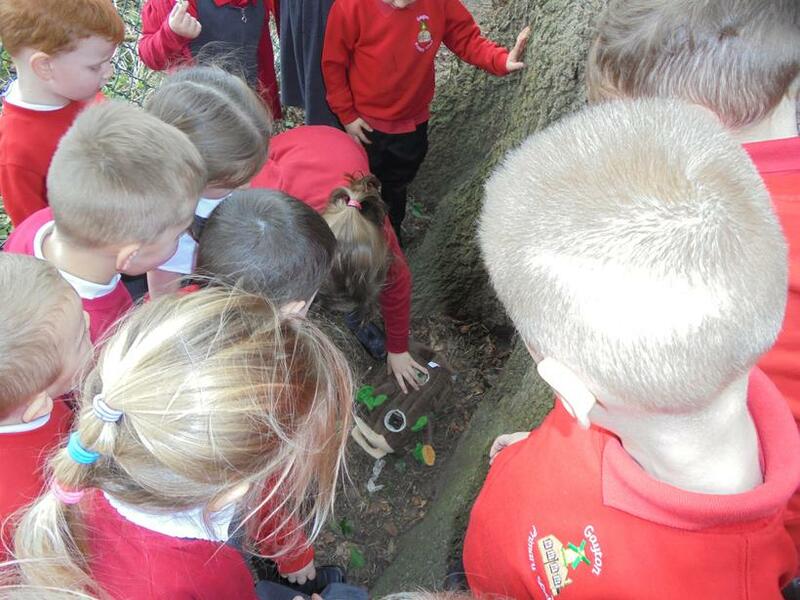 The children didn't know where these were from but some of them were worried about what we might find next. 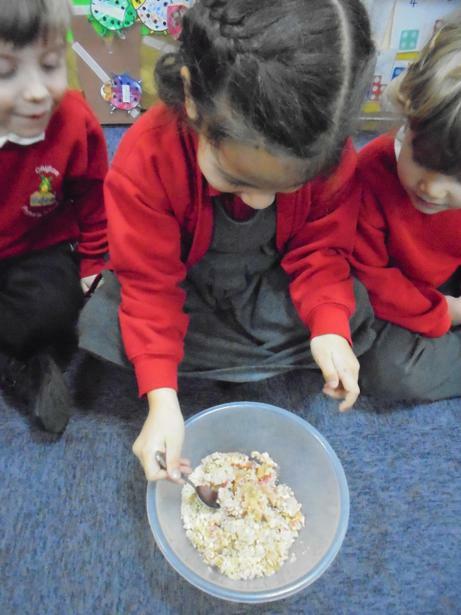 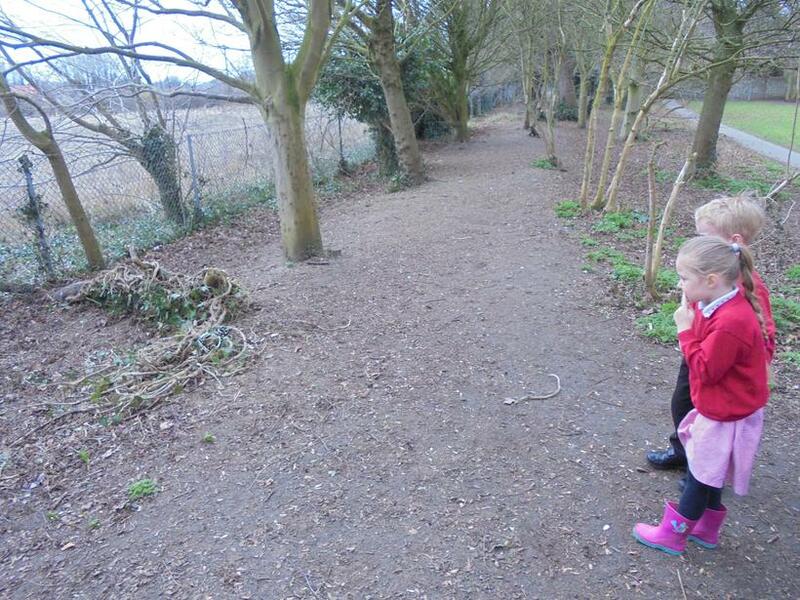 Further into the deep dark wood we found some crumble...Gruffalo Crumble! 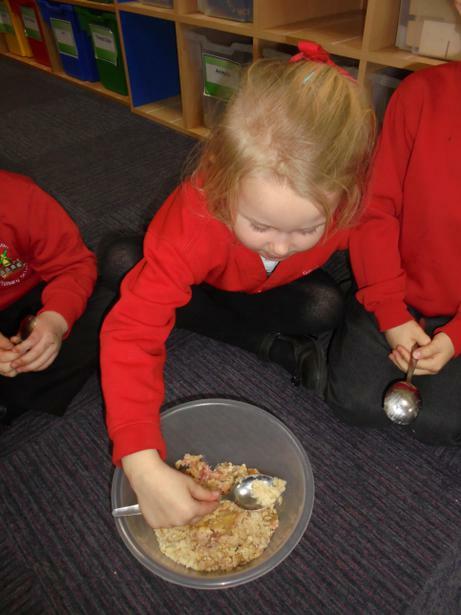 We took the crumble back to the classroom and talked about what it could be, we all smelt it and some of us thought it smelt life Gruffalo. 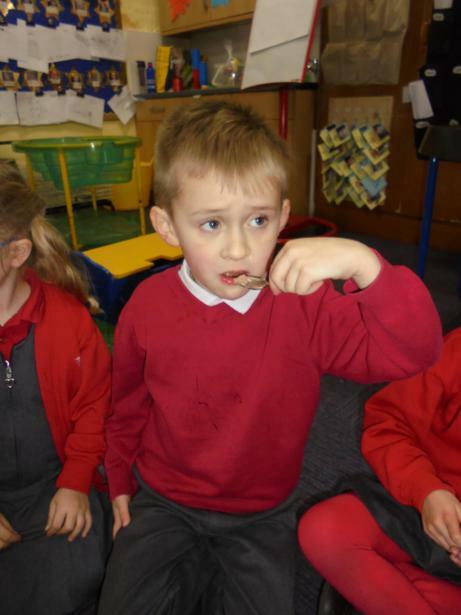 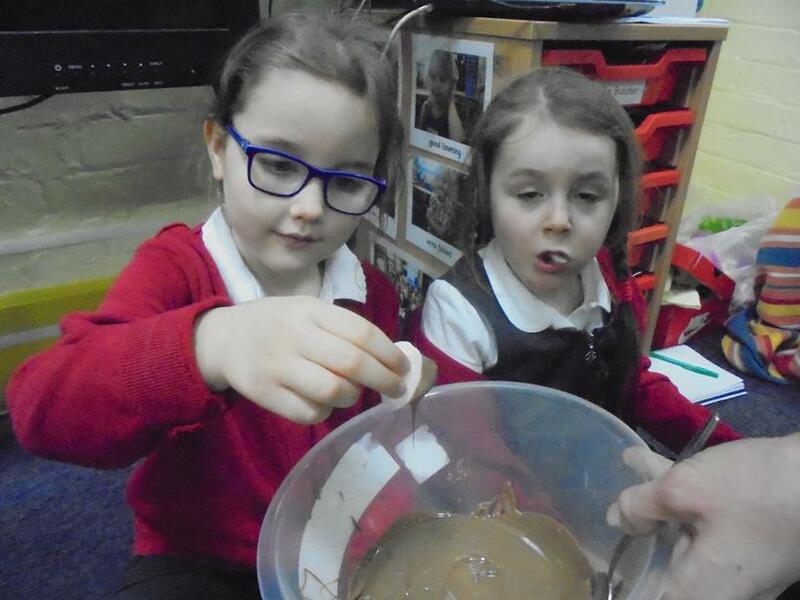 Some of the children were really brave and tasted it...yuck! 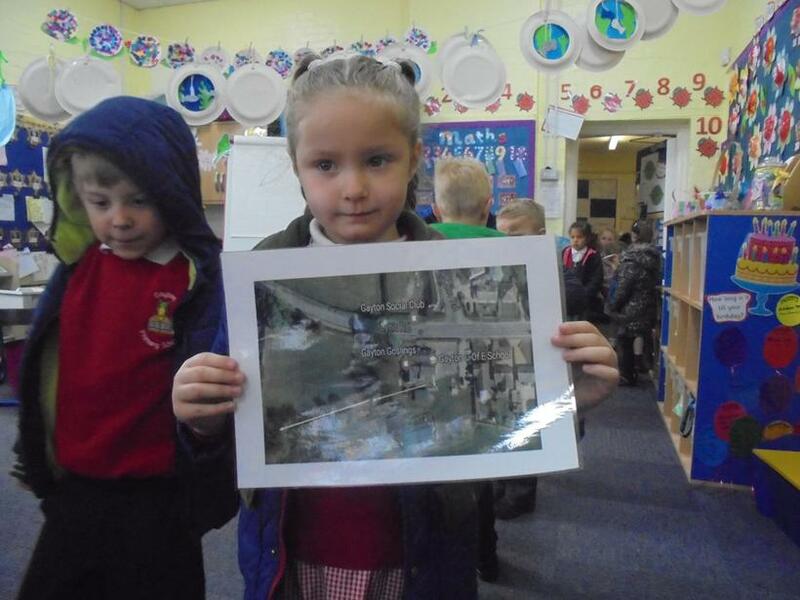 Today we found a photograph of our school taken from the sky, some arrows had been drawn on it. 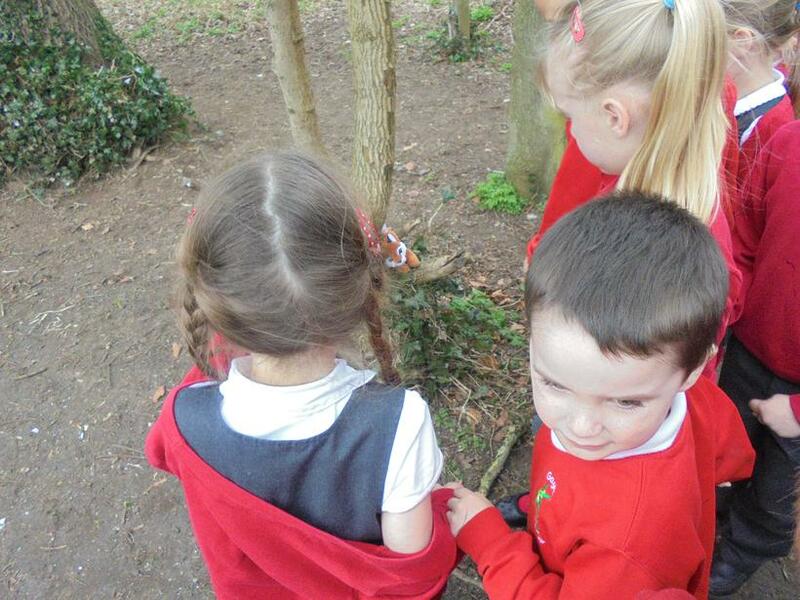 We thought it would be interesting to follow the arrows and see what they were for. 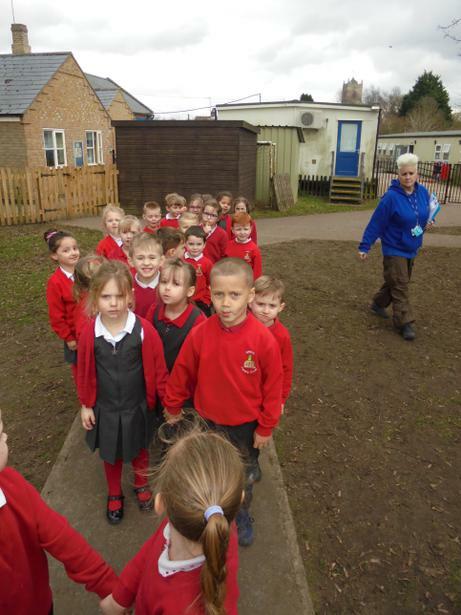 We walked towards the field and noticed a magic bean on the ground, the further we walked the more beans we saw. 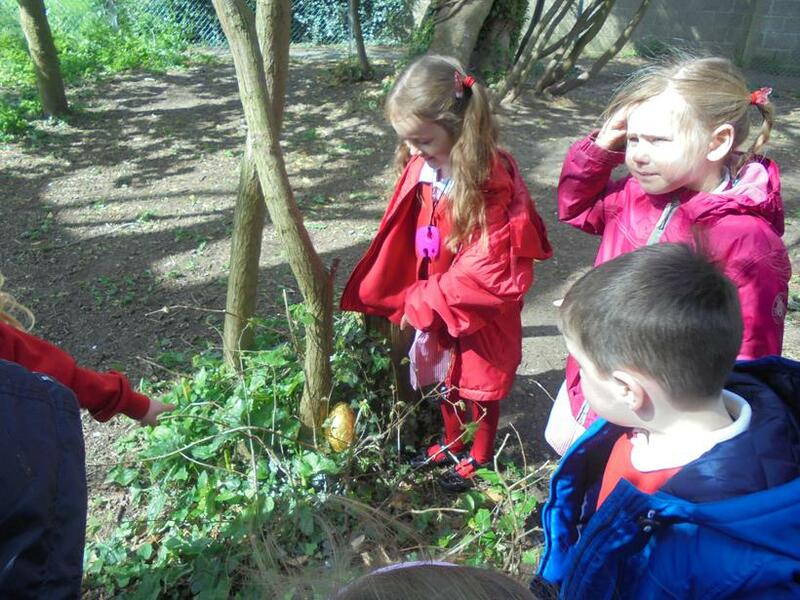 Eventually we came to the end of the trail and there we found a giant golden egg. 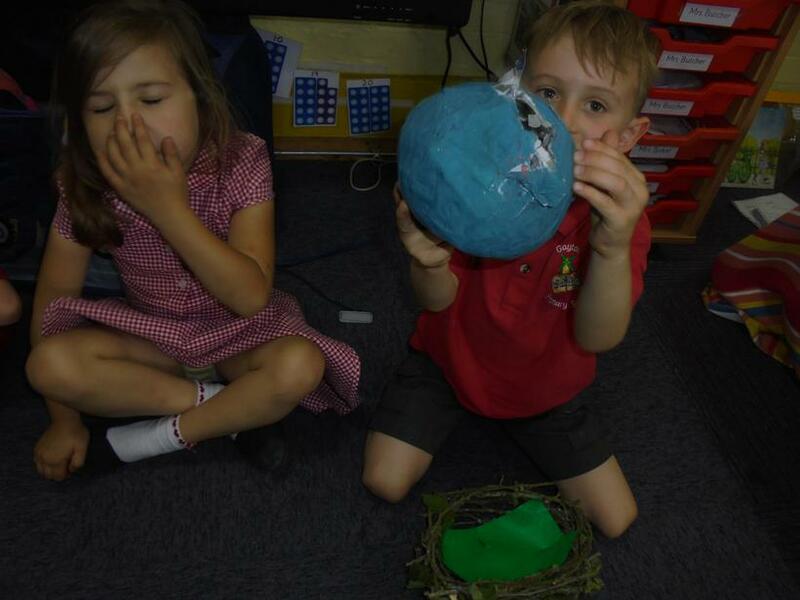 Some of the children realised that these things could have come from a story called Jack and the Beanstalk. 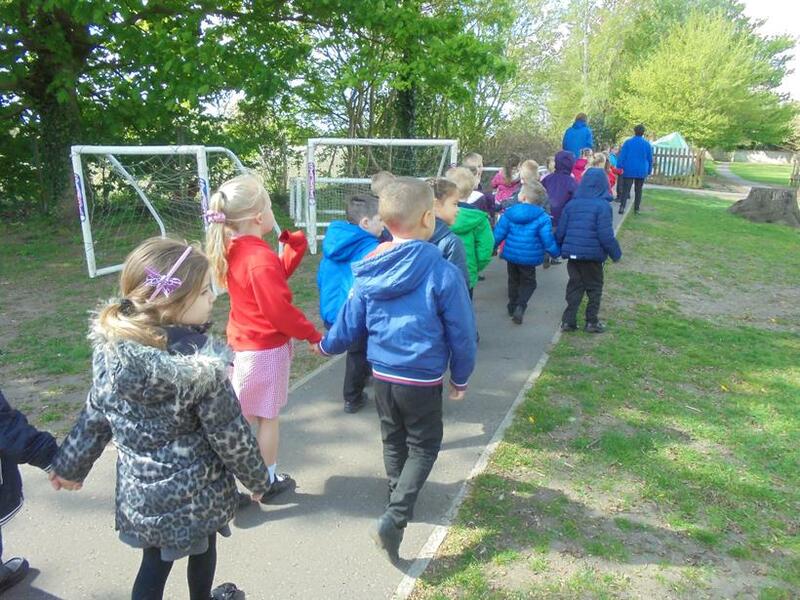 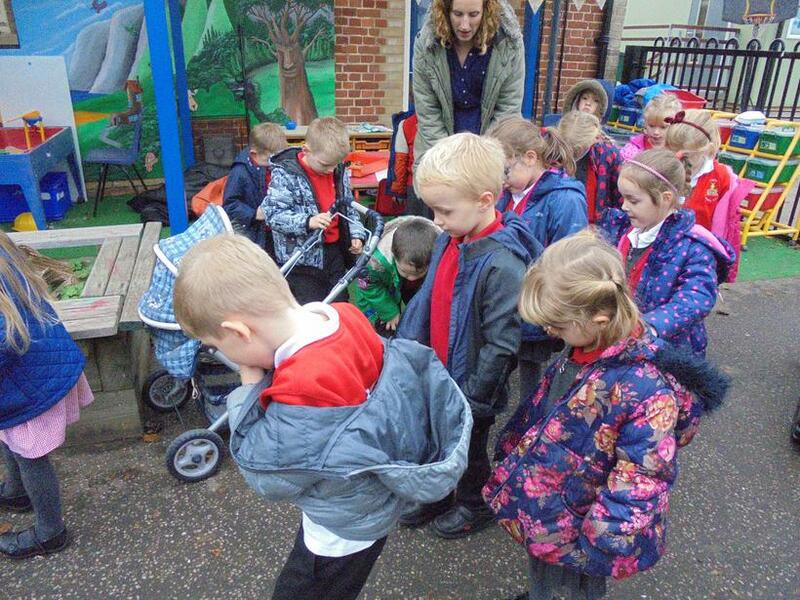 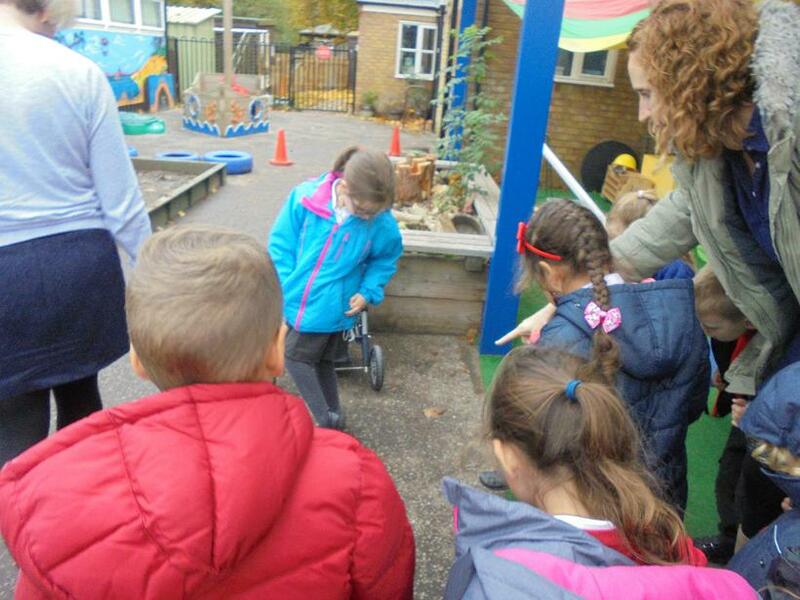 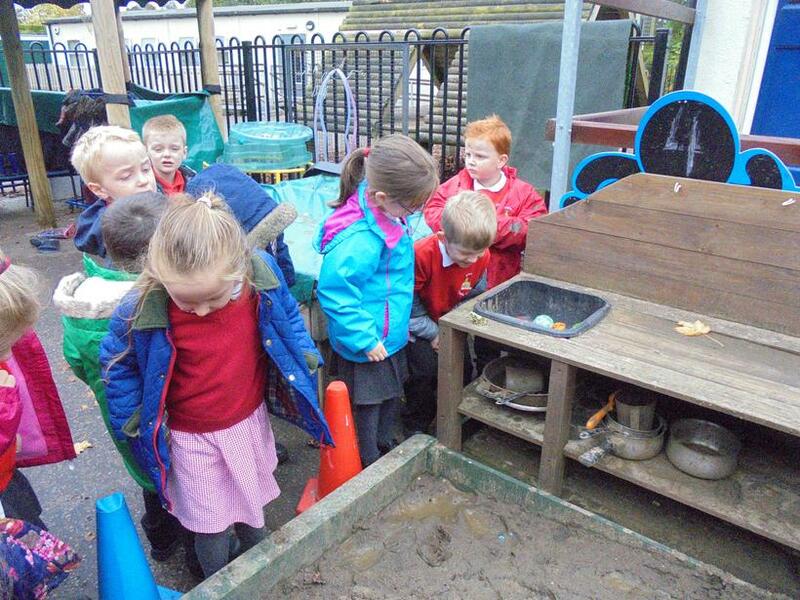 We decided to take the magic beans and the egg back to the classroom, it is a bit worrying because there might be a giant looking for this golden egg! 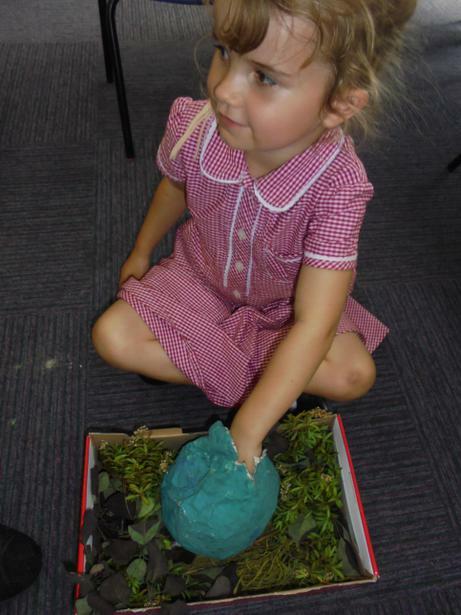 Back at the classroom we planted the magic beans, watered them and popped them on the windowsill. 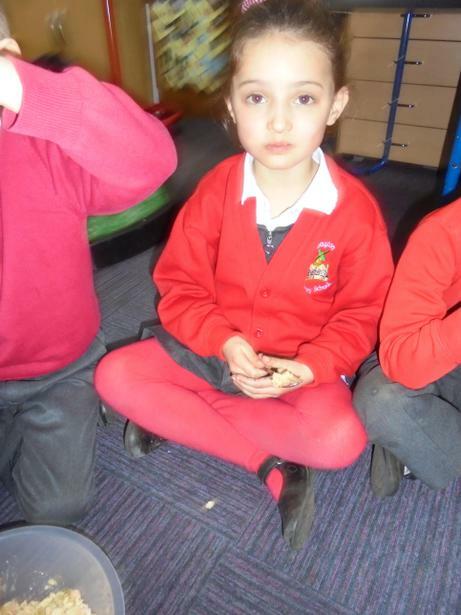 The day after we planted the magic beans a beanstalk had grown inside our classroom! 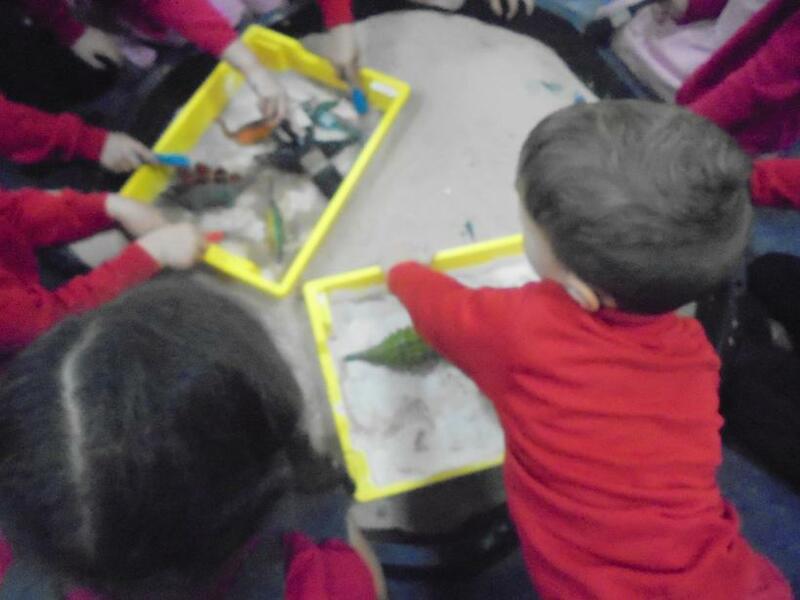 Today we pretended to be real paleontologists. 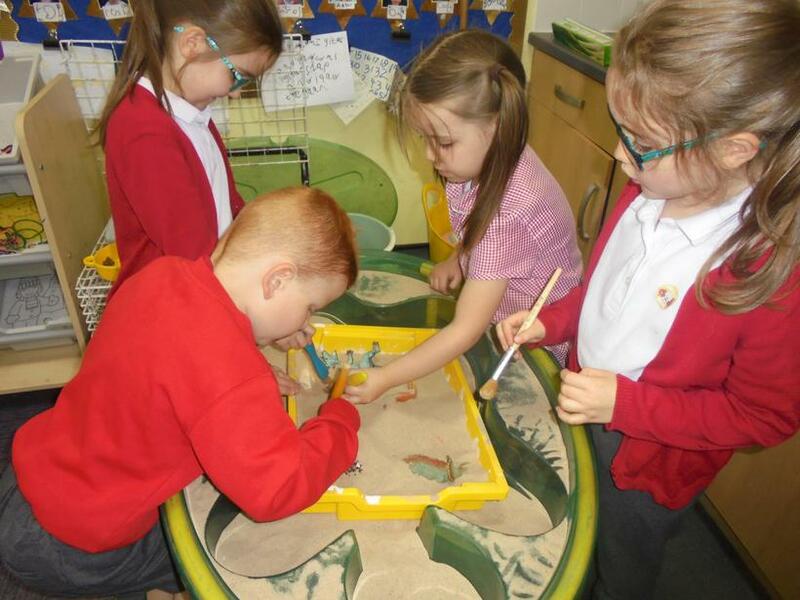 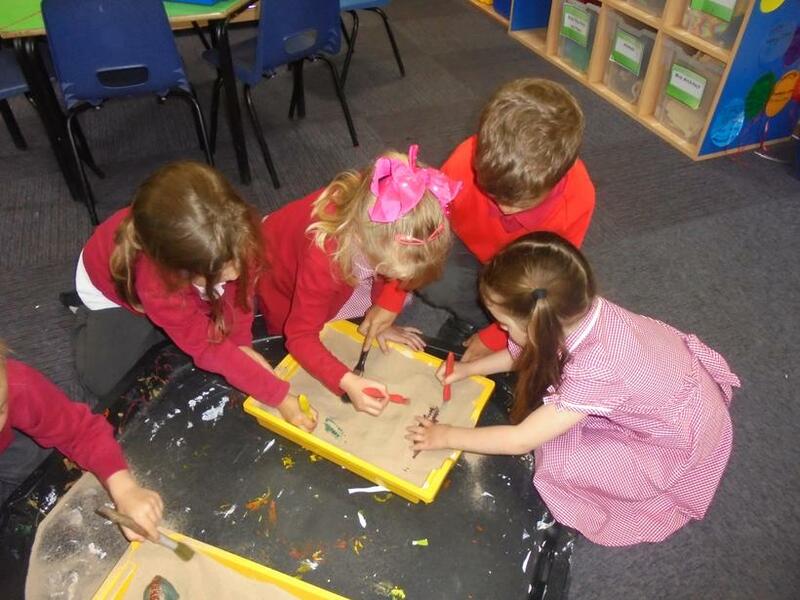 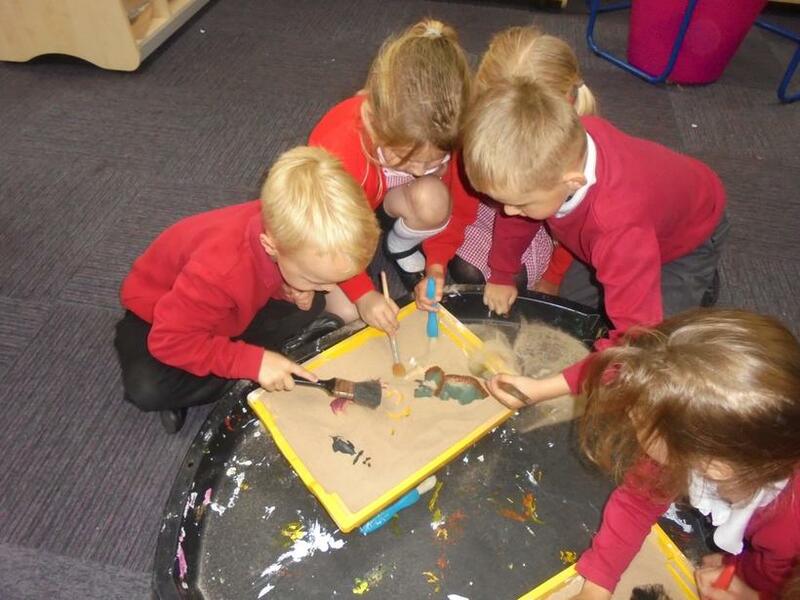 We found some dinosaurs which had been buried in the 'ground', we used delicate tools to brush away the sand and reveal each dinosaur. 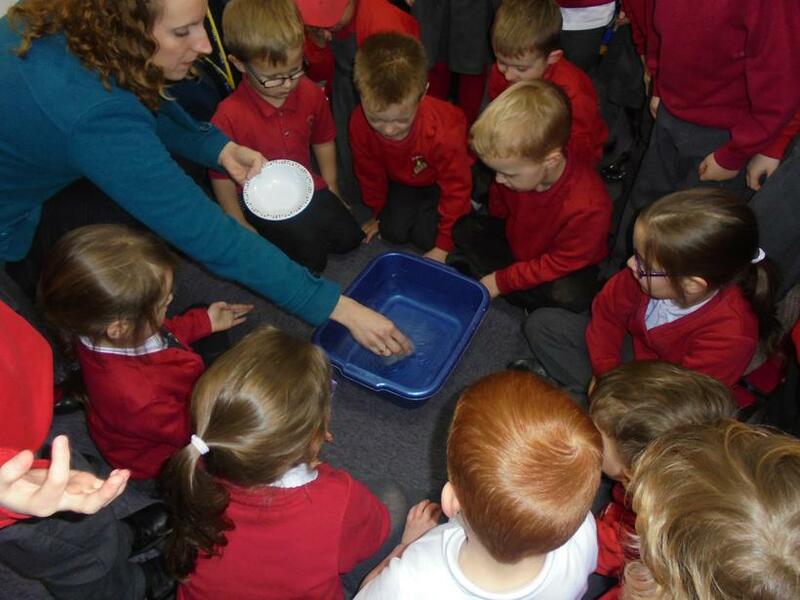 We then tried to release them. 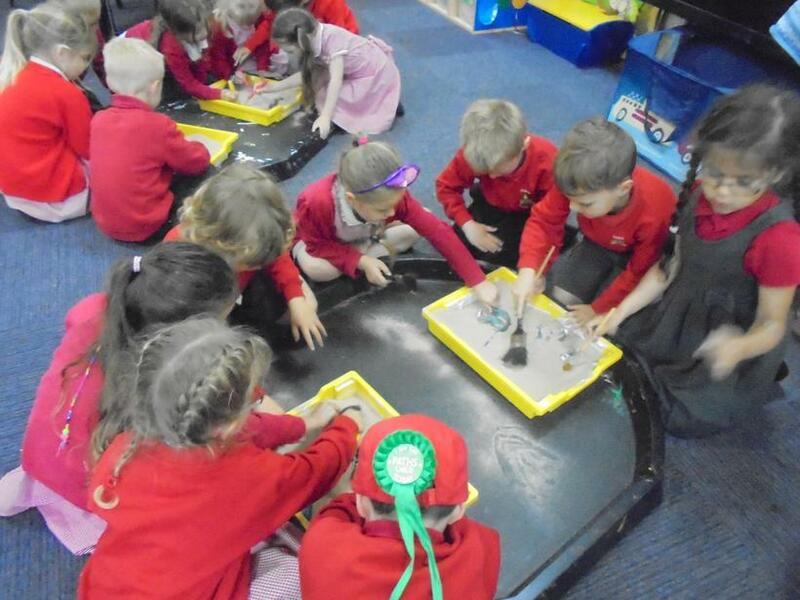 Some of the children managed to get their dinosaurs out and revealed beautiful fossil like prints in the clay. 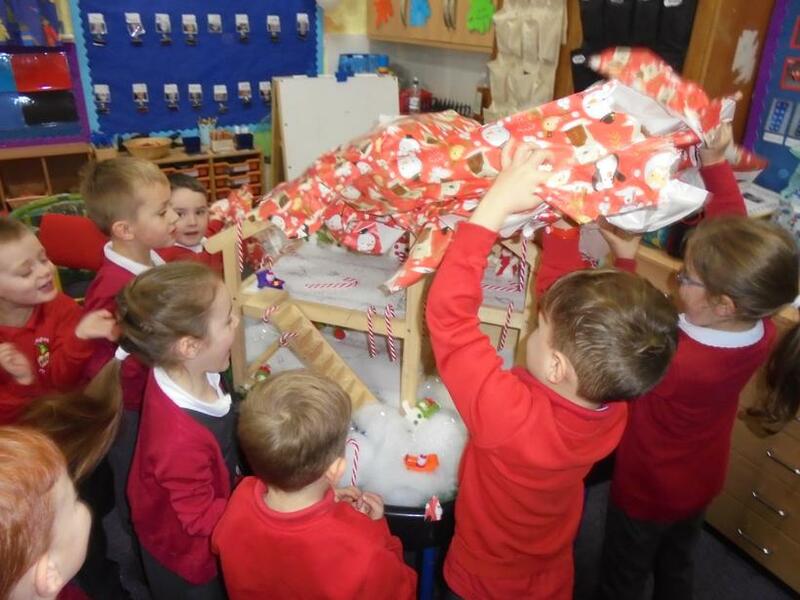 Some of the dinosaurs are still trapped. 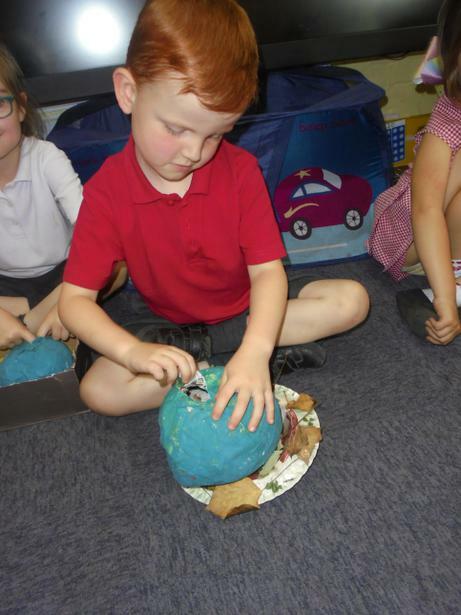 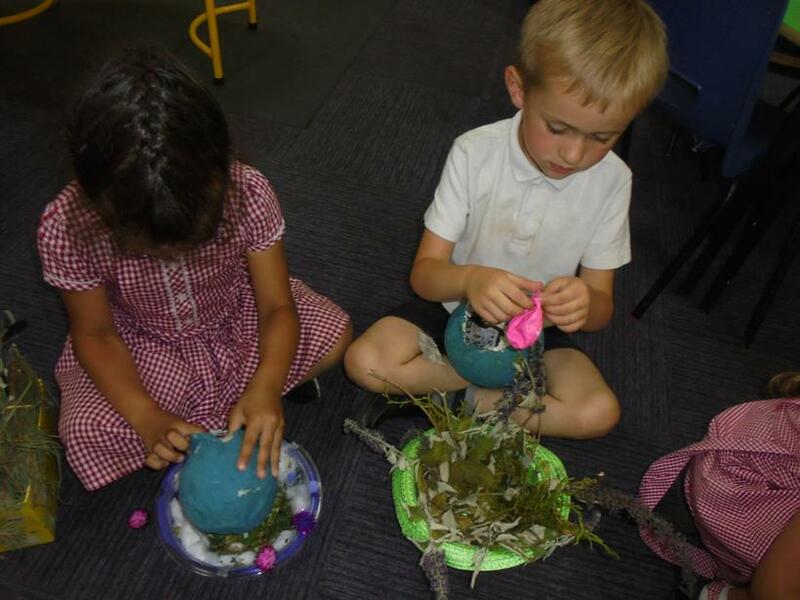 We made some dinosaur eggs using balloons and papier mache. 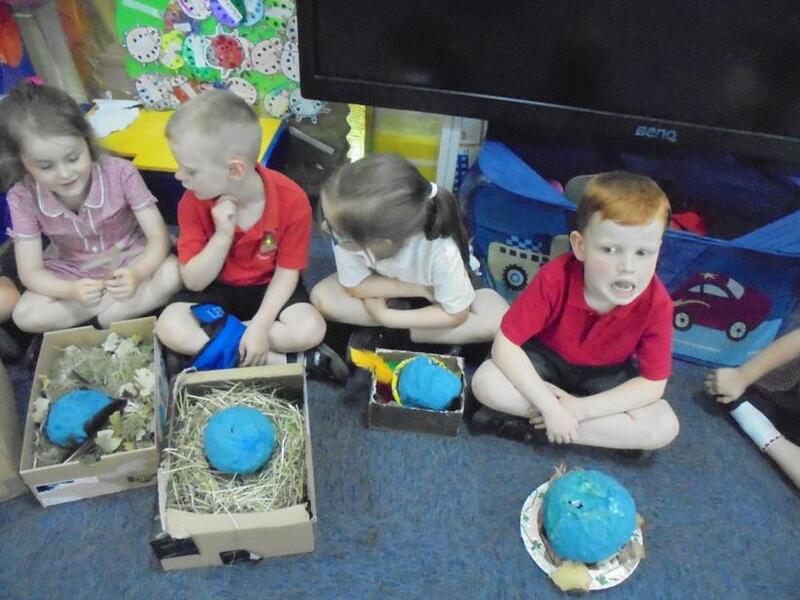 The children spent several days making their eggs and then painting them so that they looked real. 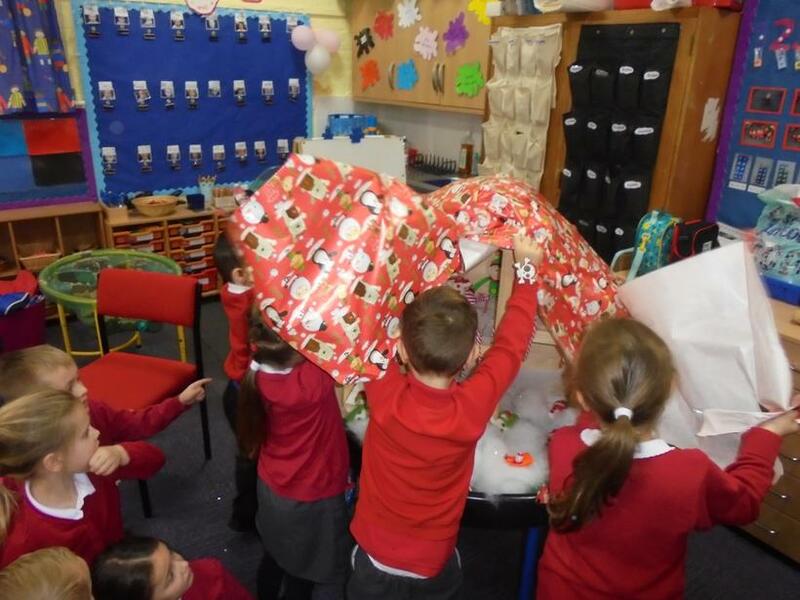 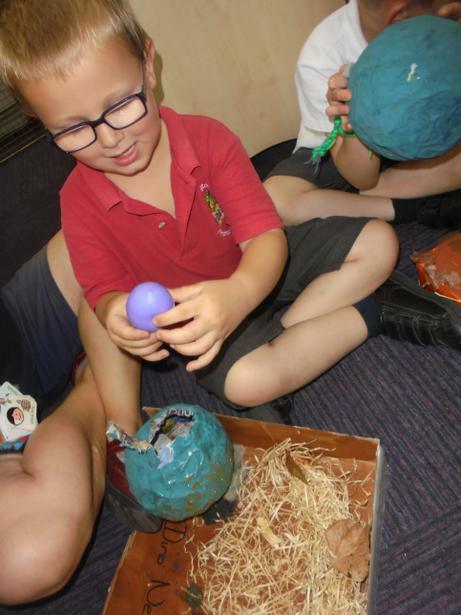 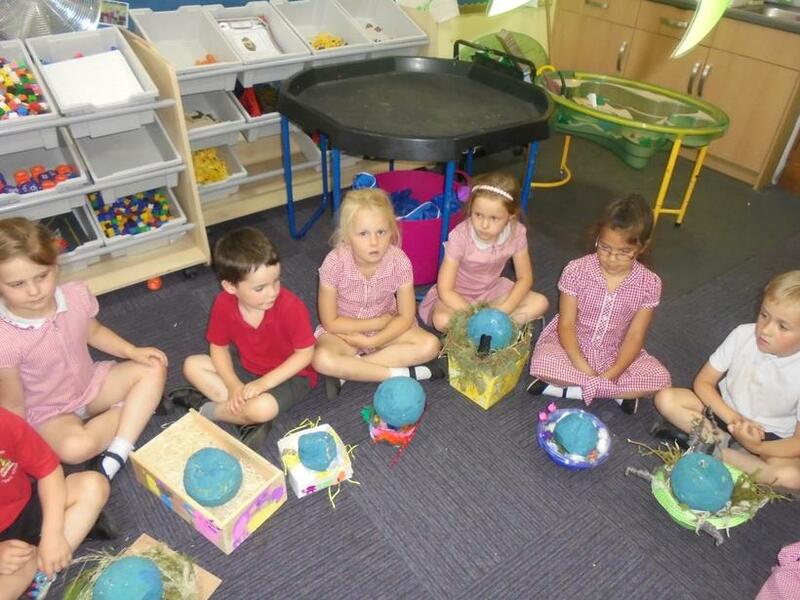 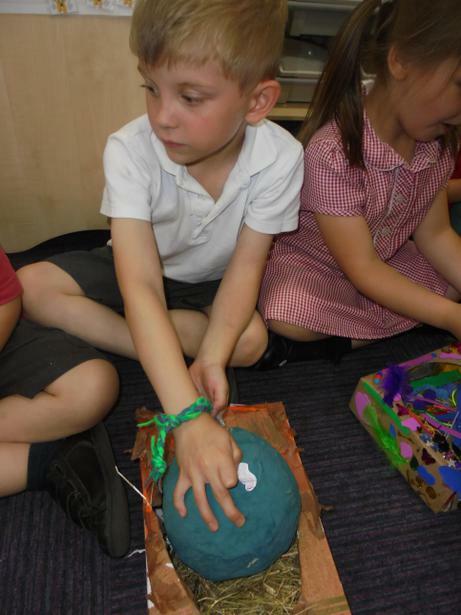 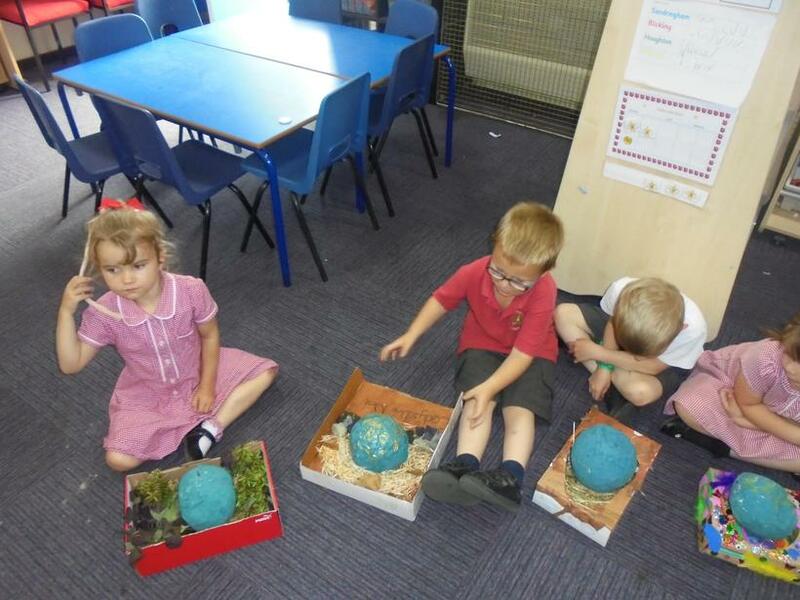 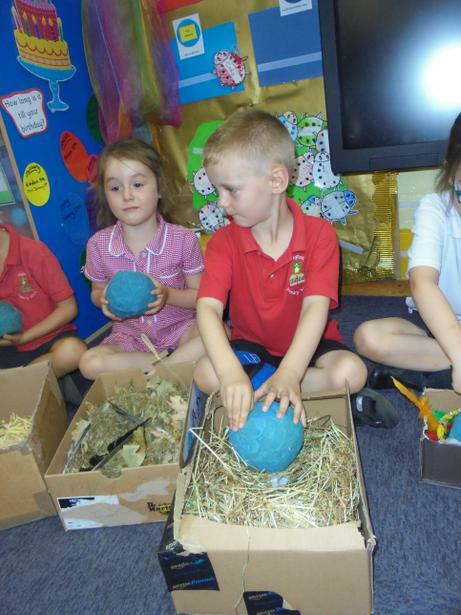 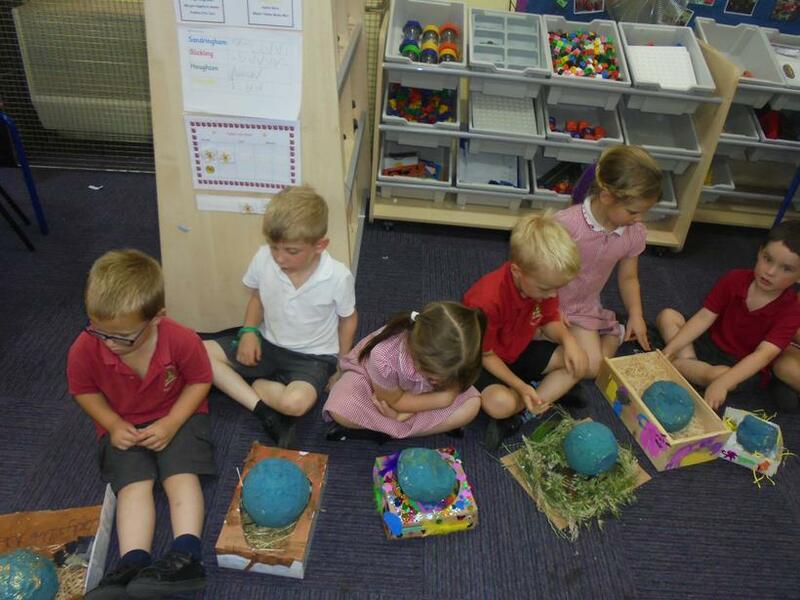 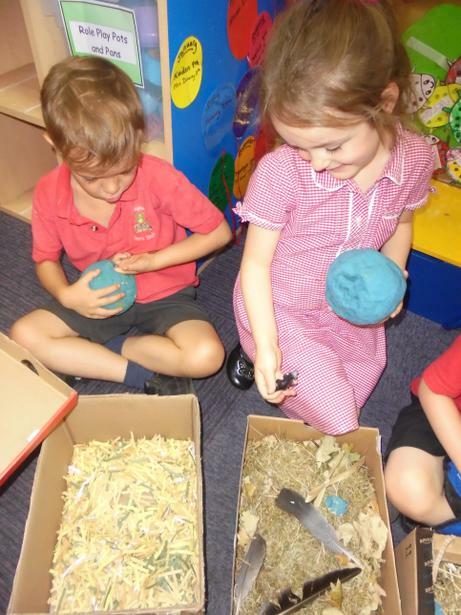 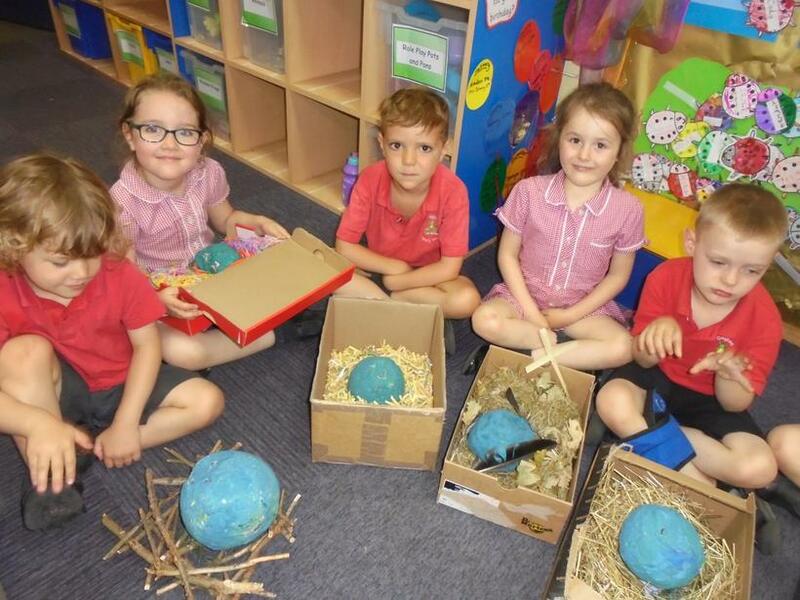 The dinosaur eggs were sent home so that the children could make a nest to keep their eggs safe. 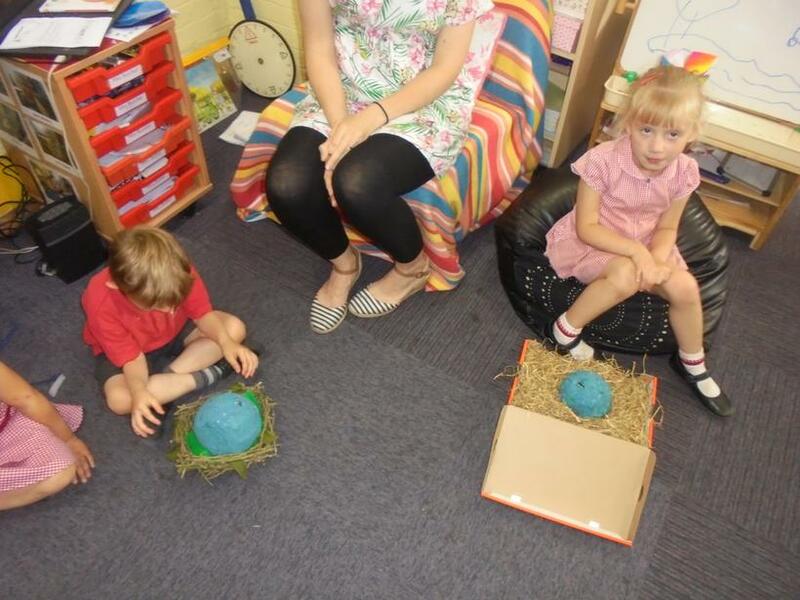 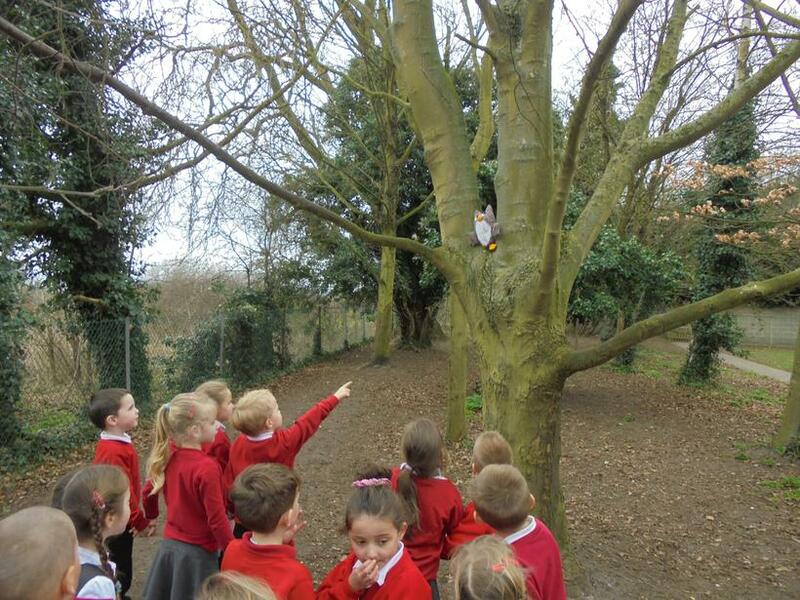 The nests which were returned to school were fantastic! 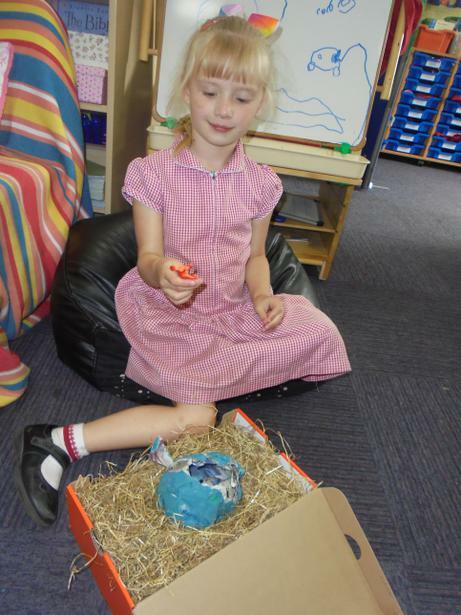 Today the eggs hatched and inside there was a real baby dinosaur. 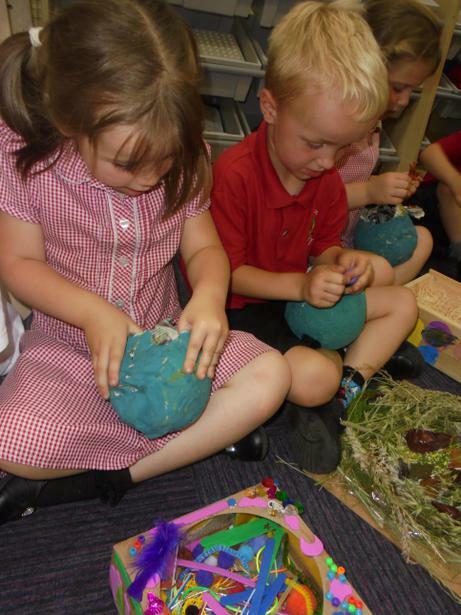 The children were very excited and together we thought of lots of things their baby dinosaur would need to help it grow and stay safe.